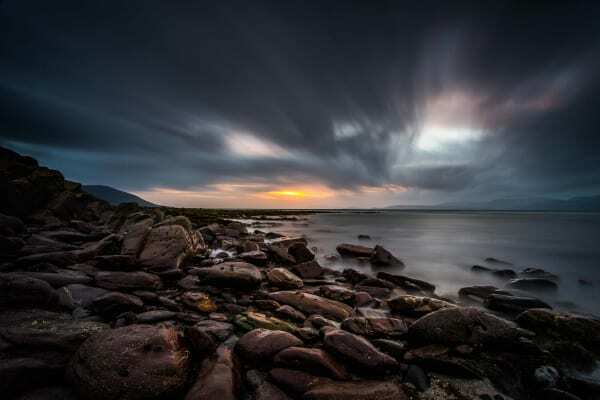 Our range of Neutral Density Graduated Filters are used to balance the exposure within a scene – typically between the bright sky and considerably darker land. Full range of ND Standards also available. For a number of years we have been making ND Grads with custom gradations for professional photographers including Joe Cornish. Now they are available to everyone and Joe explains the unique characteristics of the new Very Hard and Medium ND Grads. Our skilled UK team gradually builds up the ND gradation by dipping optically correct resin in baths of dye and continuously monitoring the results. Each filter represents up to an hour of skilled work. Because of our exacting process we are able to create four different gradations to give photographers complete creative control. ND Grads balance the exposure between the sky and ground. Here the sky was dark but the valley was even darker. A Medium ND Grad provided subtle but effective control. 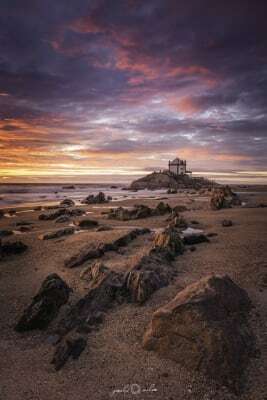 Every month we ask a respected professional photographer to select and review five of the best user images we have received that month that use a LEE filter. Take a look at this month’s selections. Send us your best work. Be original. Surprise us! Driven by a keen interest in exploring the outdoors, Andrew captures the beauty of the natural world, from expansive vistas to unique and intimate perspectives. His photos evoke the mood and emotion of a moment in time, connecting the viewer with the landscape. Andrew shares his enthusiasm through his YouTube channel. 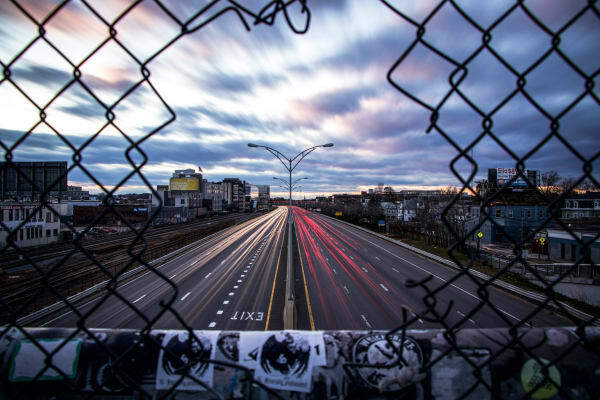 His videos take the viewer on a 'behind the scenes' journey to the locations he visits, from the initial camera setup to the final photograph. These candid and entertaining stories provide a captivating insight into his complete process. This image captured my attention and held it right away. It has so many elements that engage the viewer and help to retain their first glance. 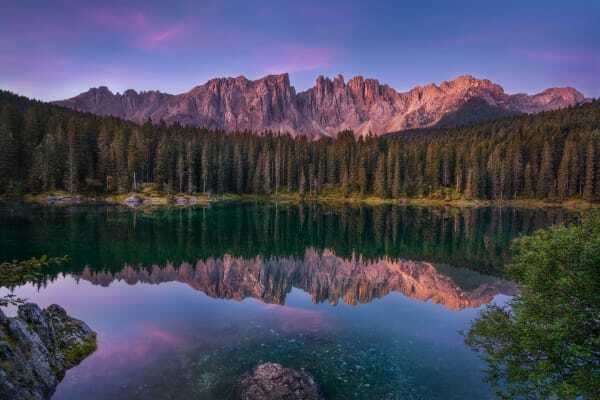 From interesting framing in the foreground, the perfect reflection that Alexander has captured in the mid-ground to the impressive mountain range which serves as a grand backdrop to the scene. I think the layers of texture and colour throughout this image creates interest and encourages the viewer to explore the scene. I would love to one day visit Yosemite, with its waterways, unique forests and majestic mountain ranges. This image has each of these elements, expertly composited to guide the viewer through the scene. 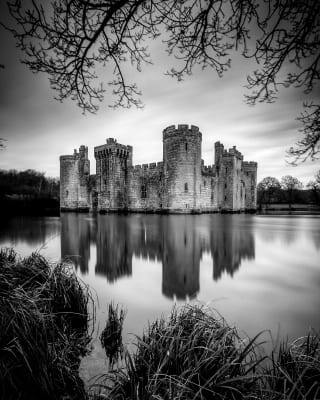 This image stands out because Ian has made the main subject of the photo obvious to the viewer, placing the castle in the centre. He has then used a few techniques to emphasise the castle and ensured it has an impact. The texture of the grass in the foreground effectively draws the eye in, and it's balanced nicely with the branches at the top of the photo that cleverly frames the building. 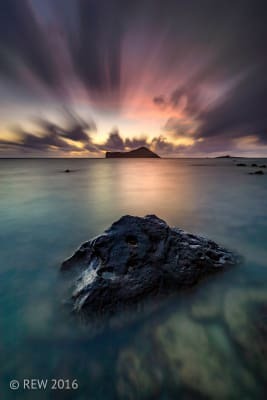 Using a combination of filters he has managed to capture the shot with a 44-second exposure, flattening any ripples in the water and softening the clouds. This approach enhances the contrast in textures that further helps the castle command attention. 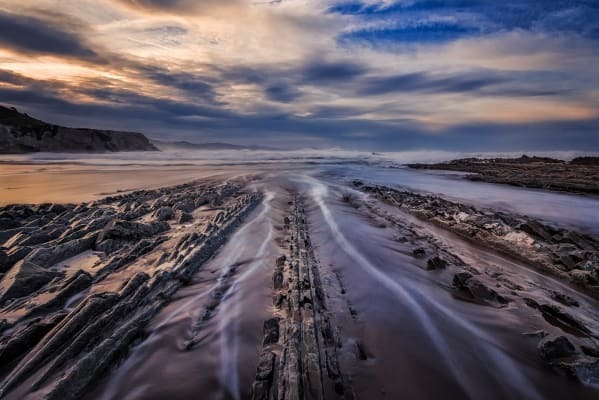 Paulo has managed to capture so many elements in this scene in a way that shares a beautiful narrative that has enticed me back to this image many times, that's a pretty good sign that a landscape, or in this case a seascape, works. The photo has texture in the sand, details in the rocks, strong composition and a scene that is bathed in gorgeous, warm light. He has pieced these elements together to convey the story of what looks like a stunning evening. 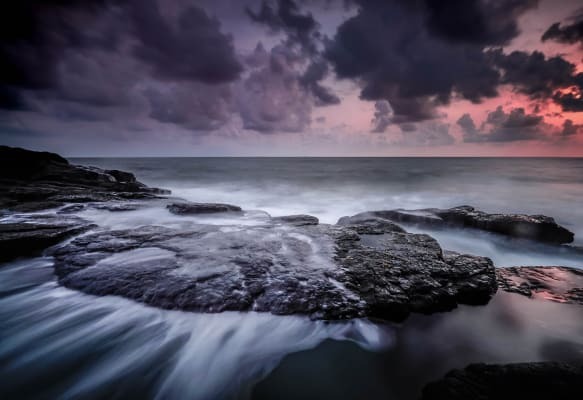 Getting the right exposure can be challenging when capturing seascapes. However, a shutter speed of 2 seconds has effectively picked up the colour but retained the detail in the clouds. The 4-stop Reverse ND has helped even the light out across the scene. 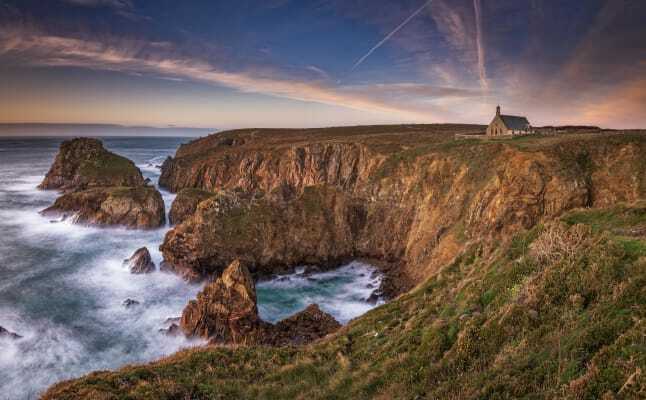 Cliffs are always great locations to explore for landscape images, and Pointe du Van in France is clearly no exception. The details in the cliff walls and the power of the waves crashing up against the rocks all make for interesting elements to this narrative. Jerome has included some of the grass and flowers in the foreground which adds context for the viewer. I think it's a nice touch that the patterns in the clouds provide some leading lines to the church, this emphasises it as a focal point of the image. The church adds interest to the scene that attracts the eye. I get a sense that I'm sharing this view over the cliffs with the church, which helps to connect me with the scene and the experience of being there. Next month's images will be selected by Tim Mannakee. Tim is a travel photographer from the UK, now living in France. Early in his career he travelled the world, shooting over 30,000 Kodachrome transparencies. He has now gone digital and runs tours and workshops globally. His work has been published by The Sunday Times Travel Magazine, Conde Nast, The Telegraph and many others. We welcome your best images taken using a LEE Filter. Please ensure images are at least 2000 pixels on longest side. Please only submit one image per month. Every month we ask a respected professional photographer to select and review five of the best user images we have received that month. Selected images are featured in this gallery along with the pro's comments. It's a great opportunity to show your best work to the world. 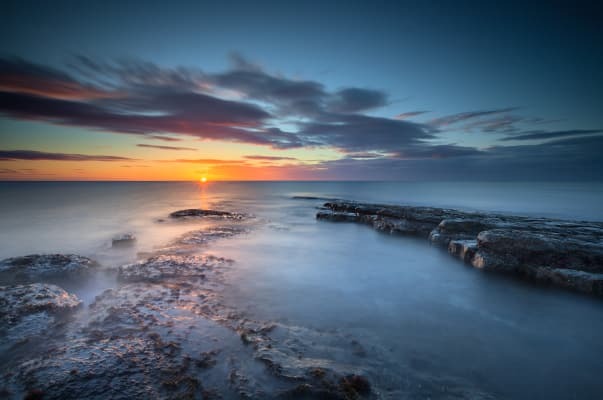 Matthew Cattell is a UK based outdoor photographer with a passion for promoting the natural world through photography, from panoramic vistas down to the finer details of our landscapes and the behaviour of the wildlife on our doorstep. 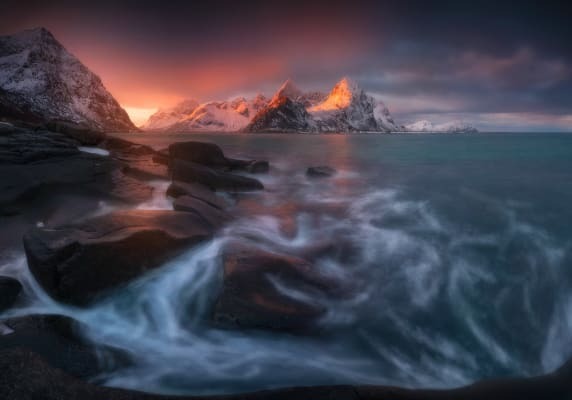 He has found success in a number of photographic competitions and was named Landscape Photographer of the Year in 2016. His work has also been featured on front covers including the Sunday Times and National Geographic Traveller magazines. 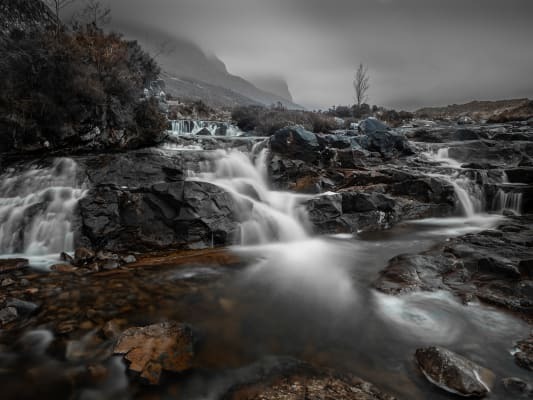 As well as producing fine art prints and writing the odd article for photography magazines, Matthew also runs 1-2-1 and group workshops which are kindly supported by LEE Filters. 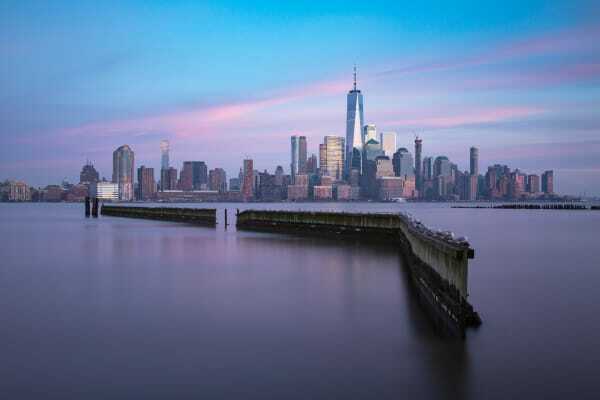 Jose has made great use of the wooden groyne as foreground interest, as its roughness and materiality contrasts beautifully with the sleek metal and glass of New York City. I also particularly enjoy how the shape of the groyne is mirrored by the diagonal line in the clouds above. It is well exposed and I’m glad to see that the saturation hasn’t been overdone. The use of a Big Stopper has smoothed out the detail in the water which could’ve been distracting. It has also blurred the movement of some, but not all, of the gulls, which I find adds further interest. This is a thoughtfully composed study of a small section of coast, which serves as a reminder that sometimes less is more. 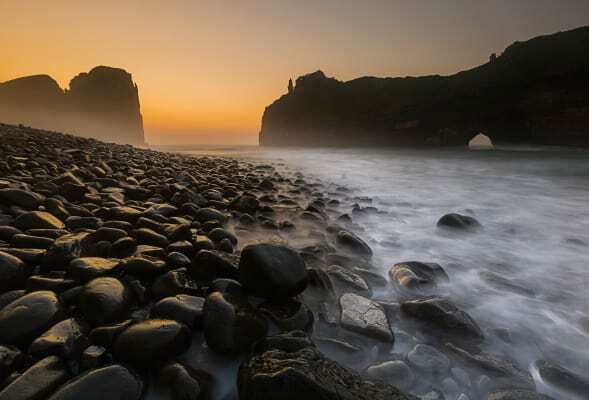 The use of a square crop allows the feature rocks to be located centrally without the composition becoming unbalanced. I also commend Purno’s use of the fractures in the rock, which lead in diagonally from the corners of the frame. 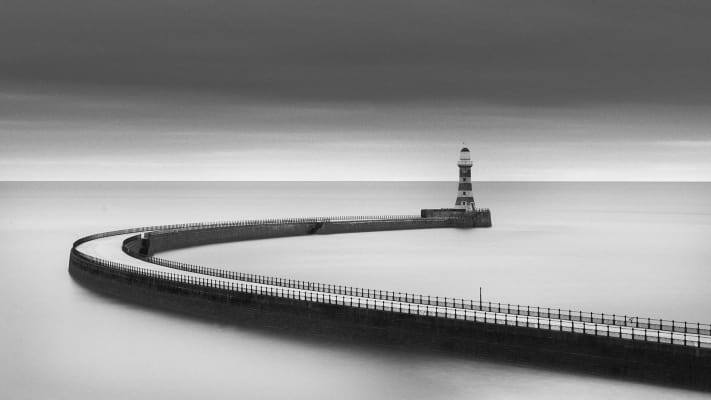 The breakwater at Newhaven is popular with photographers so it’s nice to see that Dominic has tried to do something a little different with the location. The use of a Super Stopper has removed all texture from the water and has rendered the clouds as dynamic, diagonal streaks. This has worked particularly well because the clouds are moving towards the viewer. Had the clouds been moving perpendicular to the camera then the resulting photograph would’ve appeared far more static. 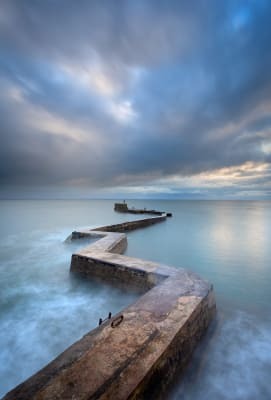 The simplicity of the composition works well, however perhaps next time be even more daring and locate the breakwater closer to the bottom of the frame to really maximise the impact of the cloudscape. This is a beautiful example from a popular location being well composed and full of autumnal atmosphere. I particularly love how the road bends off to an unknown destination. By using a telephoto lens, Pawel has compressed the scene to emphasise the rows of trees that line either side of the road. This recession has been further accentuated by the morning mist, so well done for setting an early alarm! Using a polarising filter was the right choice as it's given the colour saturation a real boost. Martin’s photograph immediately stood out when I saw it. It is flawlessly composed and a great example of what can be achieved in ‘poor light’. The 0.6 ND Hard Grad has balanced the exposure between the sky and land, and the use of a Big Stopper to feather the clouds really adds to the sense of being ‘windswept’ - an appropriate title for the photograph. 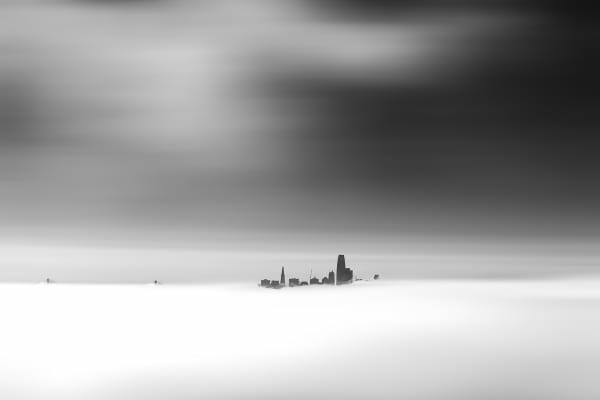 Sarah Alsayegh is a landscape and cityscape photographer based in Kuwait. Over the last 7 years she has mixed her love of landscape photography with a newfound passion for storm chasing. 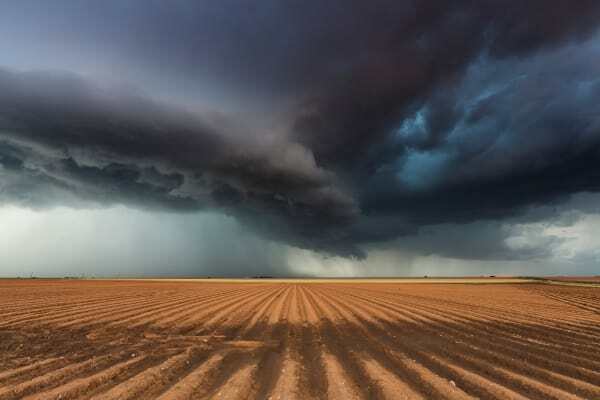 To pursue this passion, she often visits the USA to photograph storms with her friend Mike Olbinski on one his storm chasing tours, as well as capturing images of sand storms in her home city of Kuwait. 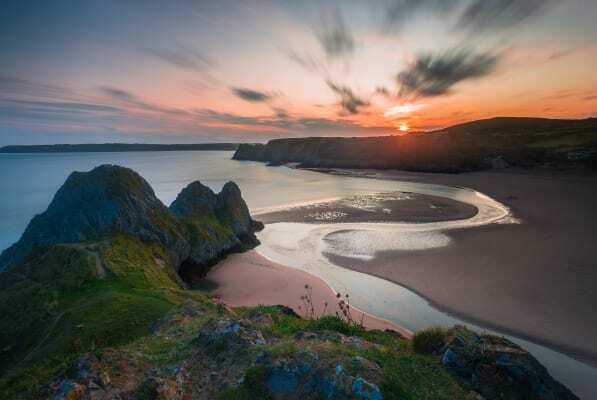 Sarah attended the first LEE Filters weekend workshop in Wales over 10 years ago at the start of her photography journey. Since then she has travelled the world and visited many locations developing and honing her skills as a landscape photographer. Most recently she was appointed as a Sony ‘Alpha Ambassador’ in the Middle East. 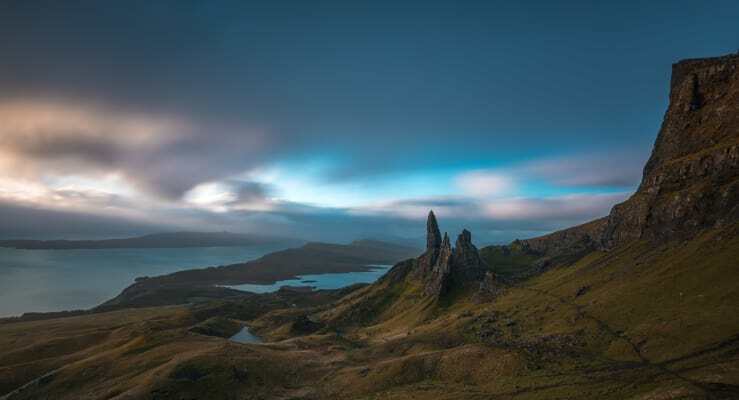 A beautiful capture from the well-known Isle of Skye. This was the first image that caught my eye as I have it on my bucket list as a place to visit. 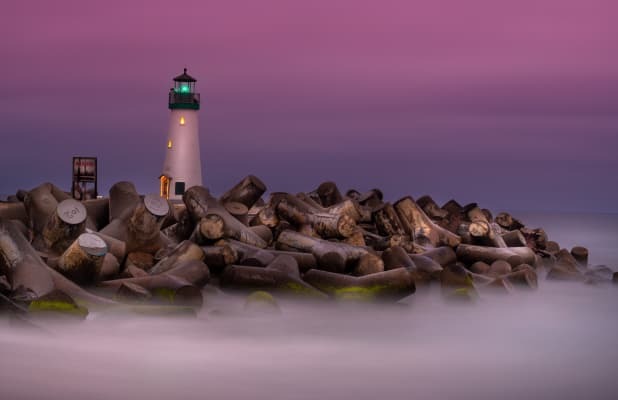 The use of the Little Stopper with a 58 second exposure was a great choice from Darryl. I particulary like the mixture of textures and colours in the sky. The processing of the image is also really nice, giving it a gentle relaxed feel. I do love long exposure fine art images. 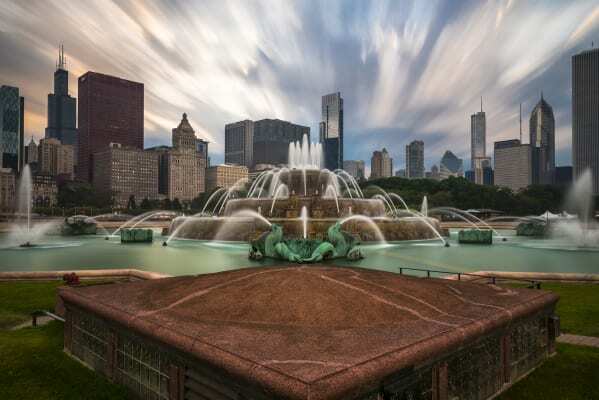 This 180 second exposure with a Big Stopper is very eye catching. I can see that Kenny shot the image at 16mm and then cropped it to get rid of the distortion, which was the right choice. I really like how the building aligns with the clouds moving above it, giving a dramatic feel. A very simple composition. The light from the sun reflected on the grass and mist is gorgeous. Very often with conditions like this you have to be patient to capture just the right moment. Peter’s exposure of 1/15th second has captured the light on the mist beautifully. The use of the 0.9 ND Soft Grad has also helped get a nice highlight in the sky. Wow! I’m in love with everything about this image, from the wet rocks in the foreground to the silky long exposure of the sea and clouds. I believe Mark made the right choice in using a Polariser along with the 0.9 ND Medium Grad and Little Stopper. It’s helped remove the glare and reflections from the rocks, as well as giving the sky a little boost. I also really like the simple processing Mark has used on this image; it has a lovely feel. 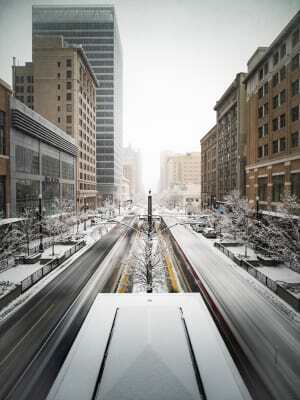 I love the calm winter feel in this image that Matthew has taken. I particularly like the dynamic range, and the use of the Big Stopper has helped control the exposure so that the snow hasn’t burnt out. I also really like the way the buildings align, giving a real sense of depth to the scene. 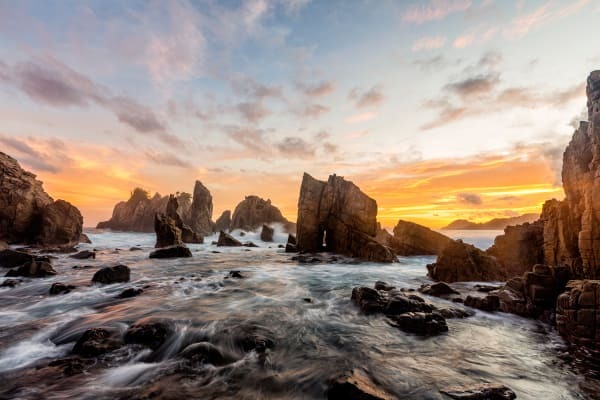 Rachael Talibart is a professional photographer specialising in the coast. She is best known for her Sirens portfolio, critically acclaimed photographs of stormy seas, named after creatures of myth and legend. This portfolio has won numerous awards and been published globally. It is also the subject of a fine art photobook. Rachael has exhibited in major London galleries, Brighton, Barcelona, New York and Massachusetts and her limited edition prints appear in private collections. 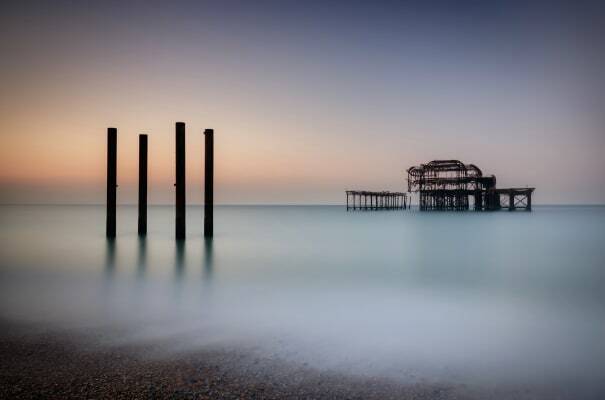 She owns f11 Workshops through which she runs photography workshops in the South East of England and she leads tours for Ocean Capture, an international fine art photography business. Rachael writes for magazines, she is an experienced public speaker, a judge for Outdoor Photographer of the Year and was named Black and White Photographer of the Year 2018. A beautiful capture of this well-known landmark. The Little Stopper was well chosen as the 13 second exposure time has softened the clouds without sacrificing their texture. It has also captured a pleasing sense of movement in the water. 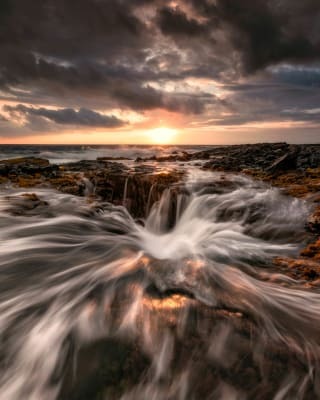 Colin has very wisely used a 0.6 ND hard grad to lift the foreground without making it feel artificial. The lovely blue and pink colours are vivid without feeling unnatural. What a dramatic picture. Using a Big Stopper, Carl has kept the shutter open for a minute, creating bold stripes from the passage of clouds across the sky. The low point of view and wide-angle accentuate this effect, isolating Carlo’s lost farmhouse in all that space. The streaky clouds partially disguise the wires coming into the frame from the right. 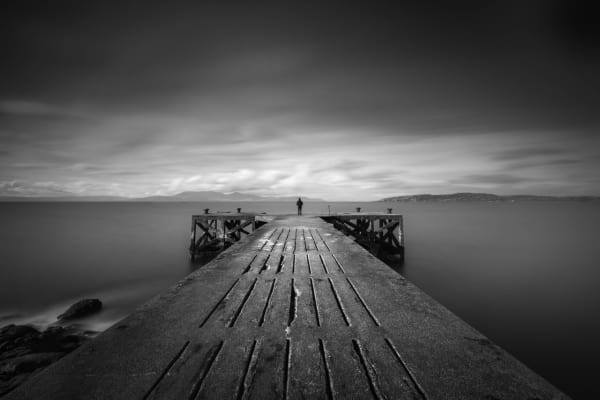 High contrast black and white accentuates the bleak atmosphere. This is an effective, simple composition. Crucially, mist or drizzle has allowed Alan to separate the old well from the trees behind. He has carried that simplicity through in his choice of a Big Stopper. The 4-minute exposure has smoothed out the water and allowed the shadow of the well and trees to bleed down towards the bottom of the frame, adding depth. 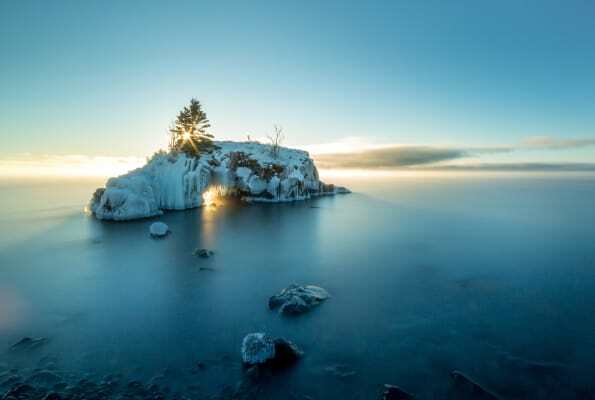 A 0.6 ND Medium Grad has held in the exposure of the sky, balancing the tone of the water. I like the way the frost on the roof carries that same tone into the middle of the picture. The blue tint adds to the wintry feel. Moving clouds on the Dolomites. The Pale di San Martino group, Italy. A powerful mountainscape. Alberto has shown off the charismatic character of the Dolomites peaks very well. Using a Big Stopper has given Alberto a 13 second exposure, enough to capture some of the eccentric eddies and whirls of clouds that happen around mountains. He’s chosen a rugged black and white conversion, making the blue sky almost black. This has allowed the lit peak to pop out. Colour could have been a distraction here. Removing it has accentuated the drama of the shapes and movement. There are some nice details to be explored too, like the little path pulling the viewer into the image on the bottom right and the small cloud drifting from the peak on the left. A thoughtfully composed photograph. I like the way Andriy has placed the bridge high in the frame, leaving lots of space for the water and the reflection. The 4-stop IRND together with a Polariser has given a shutter speed of 30 seconds and this has smoothed the water. I am actually surprised at the amount of texture still retained in the reflection - there are some nice ‘wiggly’ highlights. 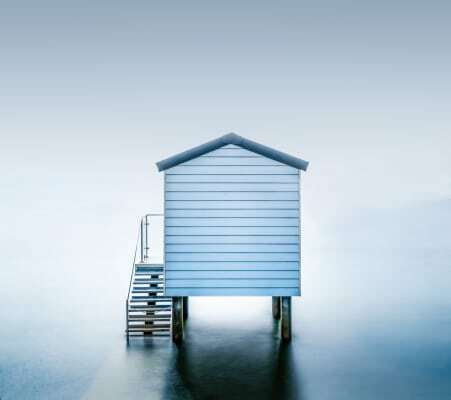 Tom Mackie has photographed landscapes the world over, and his refined sense of design, affinity with light and technical mastery has established his reputation as one of the world’s leading practitioners of the art. Tom discovered his passion for landscape photography while travelling the Western US, with its vast 'cinemascope' panoramas. Working with digital, panoramic and large format equipment, Tom's understanding of light and bold use of colour became his hallmark. He has had numerous high profile commissions spanning landscape, travel and architectural photography, and praise for his work culminated in his inclusion in The World's Top Photographers: Lansdscape. He has written two books: Photos with Impact and Landscape Photography Secrets. 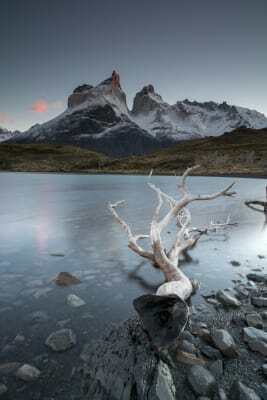 His latest publication is a fascinating collaboration with four other top photographers Digital SLR Experts: Landscape. 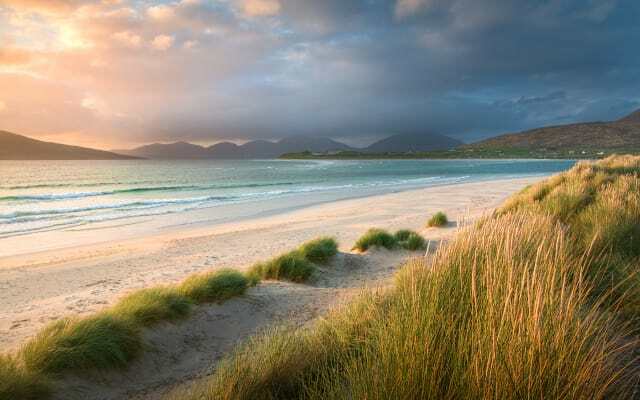 Tom runs a series of photography workshops in spectacular locations both in the UK and abroad. Ismaël has created a beautiful image consisting of soft and hard lines that takes the viewer on a journey through the image. This is so important when composing a strong composition like this, the photographer should direct the viewer through the frame using line, light and shade. The Little Stopper was the perfect choice to achieve a slowish shutter speed to blur the water, yet fast enough not to blur the line of mist. 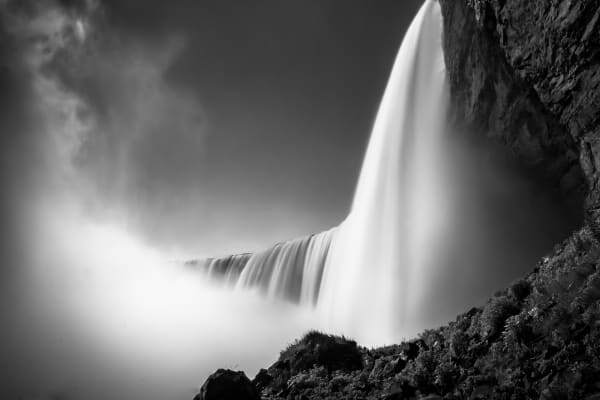 The soft line of mist has formed some interesting shapes in the upper left corner guiding the viewer down to the hard line of the base, which curves up to the top of the waterfall. This works so well in B&W as the subtle graduated tones in the bottom left corner and to the right of the waterfall maintains the interest in the falls. Soma has made good use of 3 different LEE filters. The polarising filter achieves maximum polarisation because the sun is at a right angle to the subject. This really saturates the reds and blues which provide strong contrasting colours. 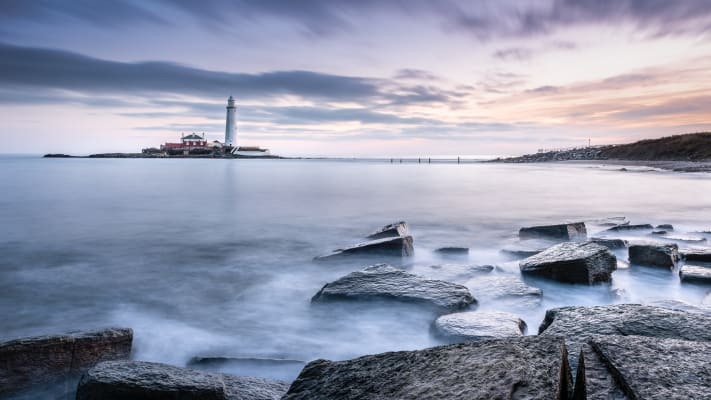 The 2 stop 0.6 ND Graduated filter balances the sky with the foreground and the Little Stopper provides movement to the waves. 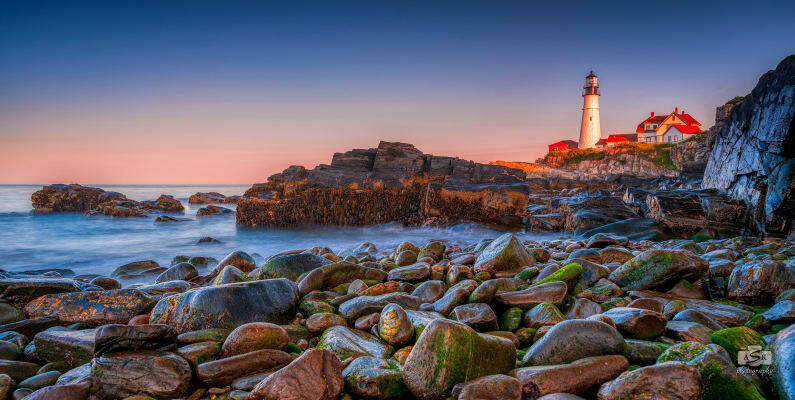 Compositionally, the lighthouse is well placed in the right third of the frame. 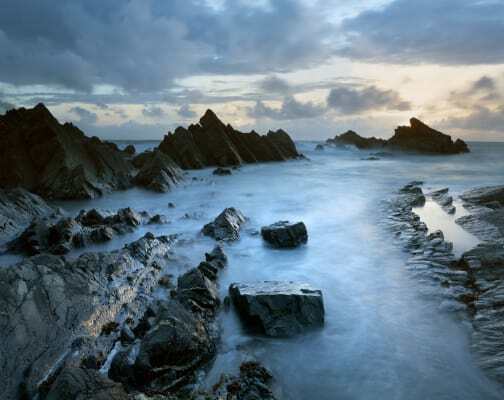 Photographing this scene with a receding tide leaves the rocks wet and shiny giving more luminosity to the foreground. I feel simplistic, graphic compositions are the strongest and Scott has created a dynamic symmetrical image. This works very well in monochrome as it relies solely on the strength of the lines and graphic shapes instead of any distraction of colour. The use of the Big Stopper and 3 stop 0.9 ND graduated filter works very well here to add a contrast of the smooth water against the pier. 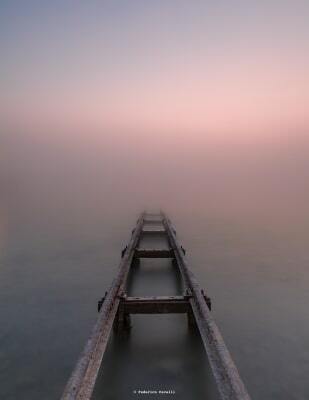 The inclusion of the person at the end of the pier is well placed and provides something for the eye to stop on. This is a stunning image full of drama, atmosphere and is well composed. 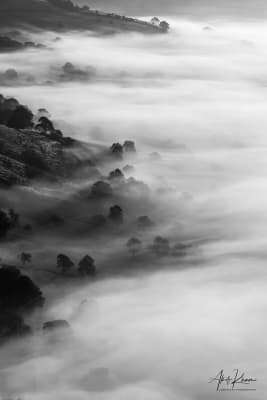 The layering effect of the ridges work well as the mist separates them so they don’t merge together as one dark mass. The sun is perfectly nestled into the mountain in the third of the frame and the clouds add to the drama and interest of the image. Johan made a good decision to use the Reverse Graduated filter instead of a normal 3 stop graduated filter, because the brightest tone is at the middle part of the frame where the sun is. Had he used a normal grad here, the top part of the frame would have been too dark losing the separation in the clouds and the area around the sun would have been too bright. This a great architectural image that is so clean, it looks more like an architects model. One very important aspect of architectural photography is to ensure the verticals are straight and Marco has accomplished this. I suspect the weather conditions were overcast and dull which makes this image work so much better in B&W. It keeps the contrast of the scene to a minimum so all of the fine details in the buildings are clear. Karl is a photographer with a particular interest in the natural world and a degree in conservation. Indeed, he often finds ecological details as intriguing and important as stunning vistas. 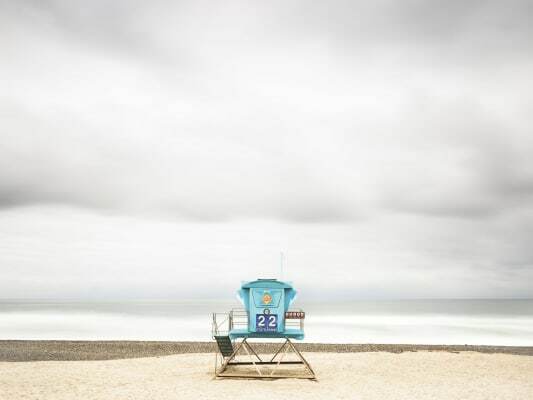 His photography ultimately aims to evoke emotion and capture the mood of a location. Karl is an internationally exhibited artist and has been featured in many notable publications. Available for commissions, he also runs bespoke workshops for photographers of all levels and regularly collaborates with the Yorkshire Wildlife Trust, leading group workshops and photo-walks. Karl is an ambassador for Sigma UK, Benro UK and Fig Bags, he is also supported by LEE Filters. This image was the first to catch my attention, mainly due to the beautiful quality of light captured here. The whole scene has a wonderfully natural feel to it, one could almost walk straight on to the beach and smell the sea air. This natural feel has been very well executed with the application of the 2 stop Medium Grad and a Polariser. It’s often easy to over do the polarisation effect but here it’s just right in my opinion. I love a good seascape and this particular image I found to be a rather beautiful scene, with very rich but importantly, not over done colours. 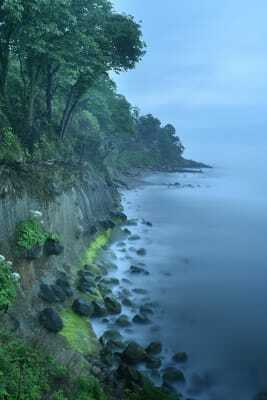 The sea has a lovely calming softness to it which has been achieved with a 4 second exposure. I feel that the choice of 3 stop hard grad is spot on for this scene, balancing the sea/sky very nicely. This bold image draws the viewer straight in to the scene with no hesitation. 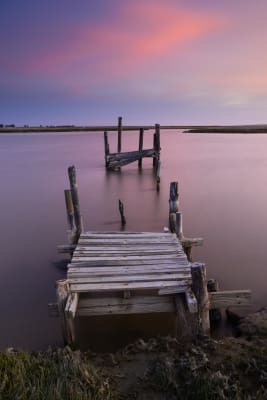 Nature has also collaborated by lining up those colourful clouds directly above this derelict jetty, the kind of light and conditions that we often hope for as photographers. Great use of the Little Stopper and Polariser to achieve a rich long exposure, with a 2 stop Hard Grad nicely balancing the sky. 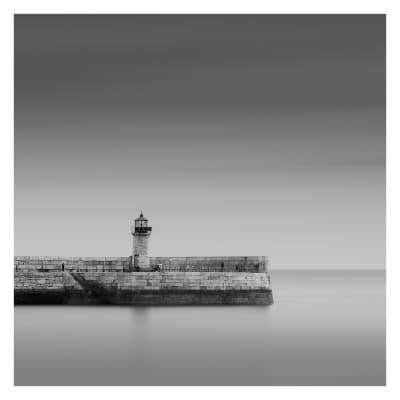 The simplicity of this image makes it instantly eye catching, a very beautiful long exposure which takes advantage of a scene which is perfect for the minimalist treatment. 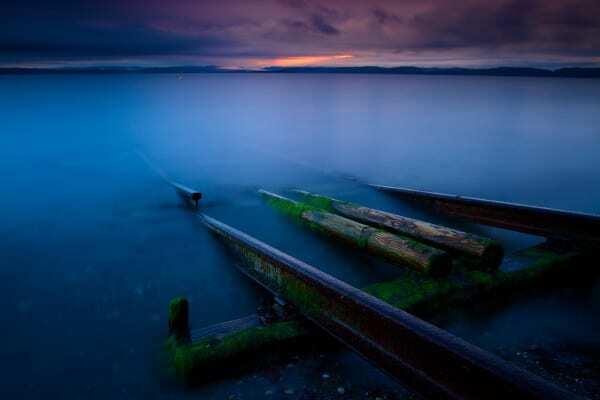 This an excellent use of the Big stopper with the foreground water fading nicely to the horizon. A very dramatic scene here with a fiery red sunset, rugged coastline and fantastic structure and texture to the sea. 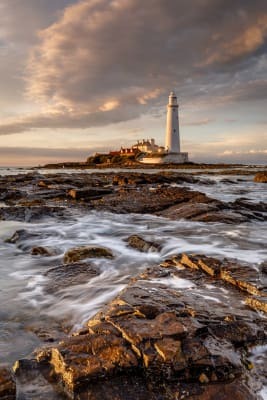 A brilliant composition too, with the foreground rocks leading us in nicely and I love the hazy lighthouse at the horizon. The whole image captures the dynamism of the coastline very well indeed! 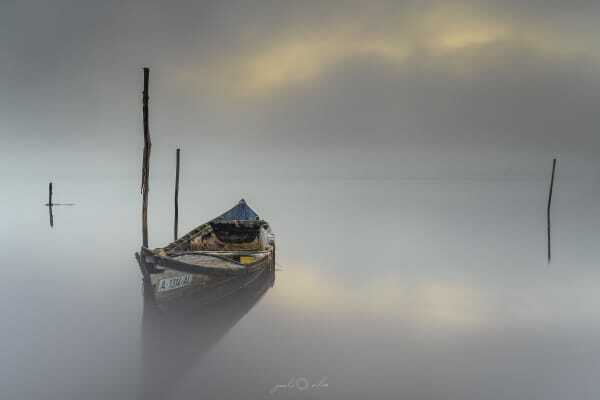 Carla Regler is a fine art photographer with a passion for landscape and seascape photography. Privileged to live on the south coast of Cornwall, Carla runs her own photography business out of beautiful Porthleven and specializes in photography workshops locally and all around the world including the Arctic Circle and many of Europe’s top photographic destinations. Carla’s images are displayed in numerous galleries, including her own in Porthleven. 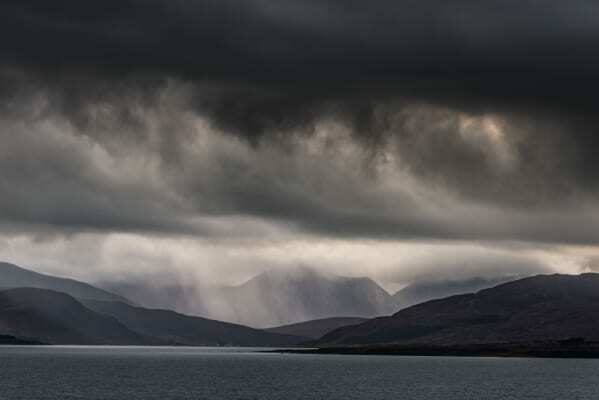 Her photographs have won many awards - including one of her recent storm images, which has become iconic and was featured all over the world after winning the prestigious British Life Photography Award. Carla's work has also been published in magazines, newspapers, online and has hung in the corridors of the Royal Albert Hall. Carla also has a keen interest in Lightroom & Photoshop techniques and offers regular workshops and training sessions to her clients on location or based in her family run café in Porthleven. This was one of the first images to catch my eye, a great example of a Big Stopper image, its simplicity and the way the light catches the metal railings really sets this image off well. Without the light catching those railings this image would not be as powerful. I love the fact it draws you into the picture, pulls you into that warm light, helped by the splash of red in the middle of the picture. The Polariser and Big Stopper are working well together here. I have a deep fascination of lighthouse structures, how varied and isolated they often are. What I enjoy here is the moment of light which has been captured across the landscape, the rocks and the lighthouse itself. This light is enhanced by the use of the Big Stopper, freezing the water around the rock ledges creating that moment of calm, and allowing the clouds to soften draws your focus to where the light is, it has also enhanced the detail in the rocks. For those that know me, waves and patterns I love, this image really captured my thoughts, not only for its uniqueness to waves with blues and silver tones but also to the sheer intensity of the fog even with a Big Stopper on. Keeping something real in the picture allows the viewer to lock onto and imagine being there, the lights from the house are just visible through the fog and this is a really lovely capture. What an amazing blue hour image, this image has a real mix of tones from the pink sky to the green light and lichens. 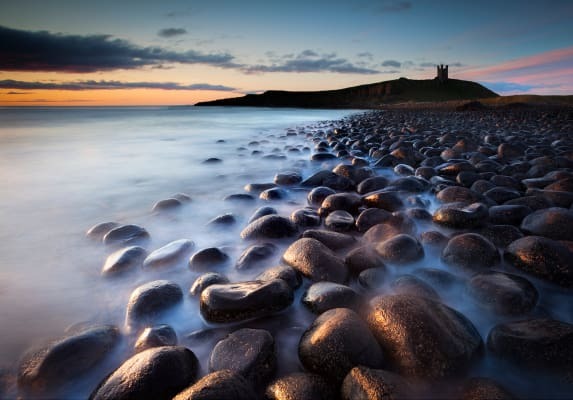 A great scene which is perfect for the Little Stopper and Soft ND Grad that Kurt has used. You can see the tide was high around those interesting concrete shapes and the smooth water really exaggerates the edges of the rocks. 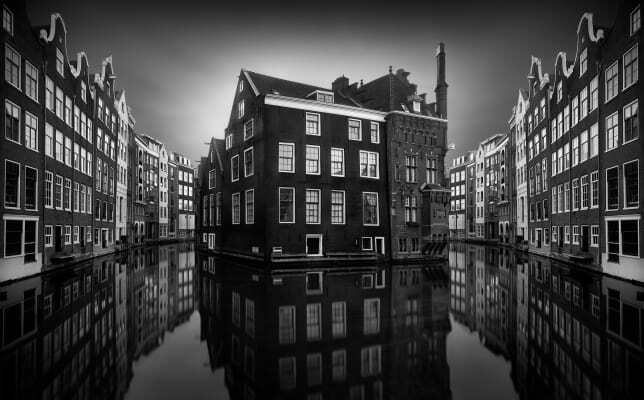 Wilco Dragt is a Dutch fine art landscape photographer. After a career in business administration he decided to plunge into professional photography. He is known for his minimalistic and stylish work, and for considered compositions that are stripped down to the bare essentials. 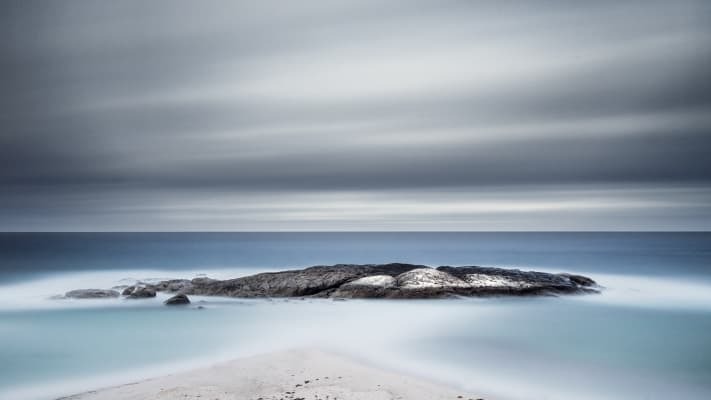 Wilco has a preference for waterscapes and snowscapes and in order to make his images minimal he quite often uses long exposure times. Most of his work is in black and white and several art galleries sell his work to a wide audience. Next to his own photography he runs workshops and photo tours. Quite a few of these tours are located in the UK, mainly in Scotland. From the first time he visited, he fell in love with the country. This image is all about colour. The opposing colours yellow and blue immediately draw our attention. 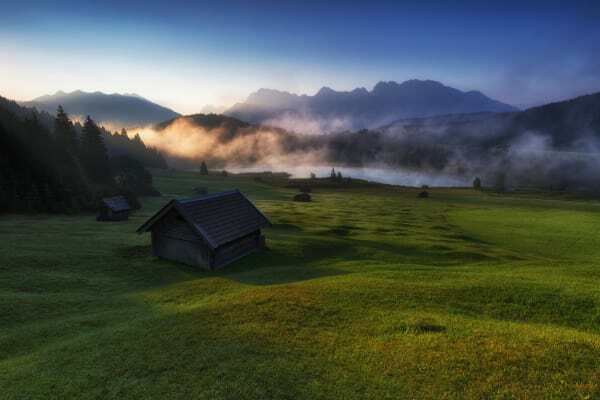 I like the placement of the tree on the left, where the ridge with pine trees on the right creates balance in the image. The use of a Little Stopper resulted in an exposure time of 3 minutes, leaving some structure in the water. A longer exposure time would have flattened the water surface entirely, making it rather dead. What a shot! Simplicity is key, and it definitely proves less is more. The composition is very elegant, with all the elements very well placed. The black line in the sand draws you into the scene, to the sea and the mountain in the distance. The small triangle of sand on the left side adds a nice touch to the image. I do like the dramatic sky, with lots of movement in it. With an exposure time of “only” 15 seconds the clouds are still visible. Both the ND and the ND Grad were very well used! Processing is excellent, with a nice balance between soft, light and dark tones. The dark mountain in the background is crucial: without it the tones would be rather flat. This is a rather daring composition, with lots of empty space, and it shows that a beautiful photo does not have to be about something beautiful in itself. It is the skill of the photographer that can create beauty out of something quite ordinary. The blue of the tower and the yellow of the beach are nice contrasting colours. Adding more of the beach in the composition would not have made the image stronger. It is the large amount of sky that creates a specific mood and atmosphere, giving the viewer plenty of room for his own thoughts and feelings. Sunset light on the Marmolada. A gorgeous mountain range with gorgeous light! The Dolomites are amongst the finest mountain ranges of Europe, and very photogenic. The sheer cliffs and reddish rock walls just demand to be photographed. The challenge is to limit yourself, and the photographer succeeded in this very well here! 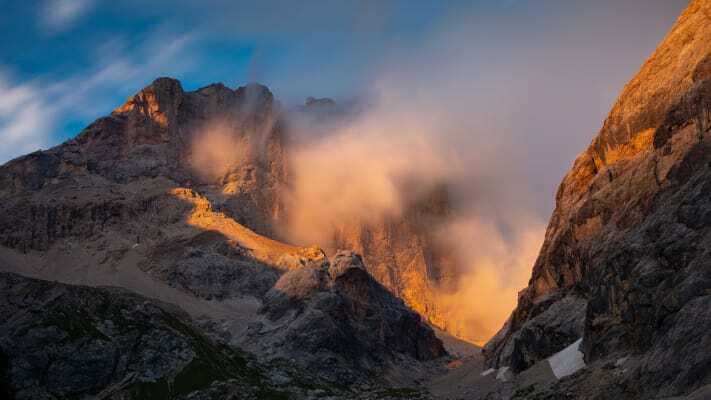 The dramatic light accentuates the colour of the Dolomite rock. A very minimalistic image of San Francisco, where you can barely see the two towers of the Golden Gate Bridge above the sea of clouds. Black and white supports the graphic nature of the picture. A true fine art photo that would do very nicely as a large print! In a graphic image the “styling” and design is very important: where to place the elements in the composition. There is room for improvement here in my opinion. On the right there is emptiness, while on the left side the bridge is rather tightly cropped. With the composition as it is now a 5:4 or 4:3 aspect ratio, with cropping of the right side, would make it stronger. 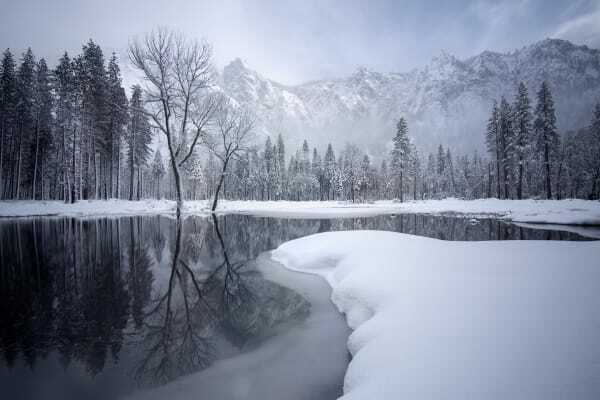 Pete Bridgwood is a fine-art landscape photographer and writer. He started making photographs almost 40 years ago, and still shoots using analogue cameras alongside his digital work. Pete has a gallery in Nottingham and is the creator and curator of the national Masters Of Vision exhibition. 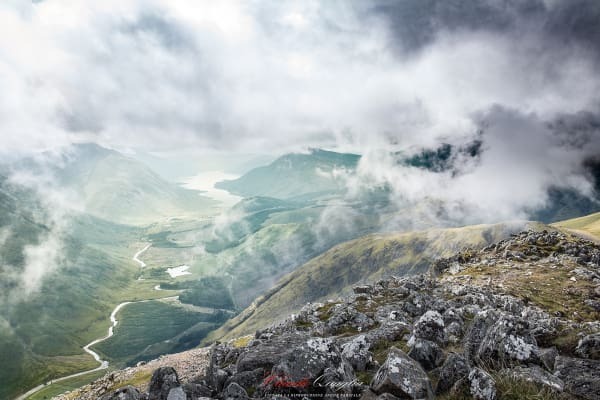 He has been part of the judging panels for Outdoor Photographer Of The Year and Landscape Photographer Of The Year and for the last decade, he has been writing a monthly column in Outdoor Photography Magazine about the aesthetics of landscape photography. 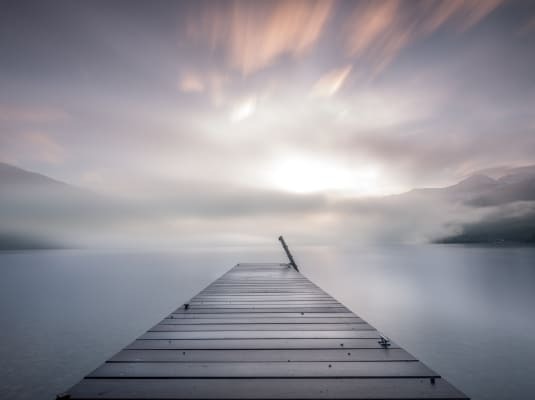 A truly wonderful and breathtakingly beautiful image displaying mastery of every stage of the photographic process including judicious use of the wonderful Reverse ND Grad. This image is all about colour: three texturally distinct bands stretch the visible spectrum of colours in a perfect juxtaposition. Red, orange and yellow set the sky ablaze, then green is separated down to occupy the lower third; and finally the rolling blue and indigo pastel cloud inversion harmonises with the foreground greens and provides a complementary juxtaposition to the inferno above. David has processed his image masterfully, unafraid to show off these colours as nature’s canvas intended. When we start creating black and white photographs, there is a gradual realisation that although seemingly so simple, it is enchantingly complex. A compelling image shot in colour, may not work at all in monochrome and vice versa. In order to create great black and white images, a different way of seeing is required; we need to look at the world with tone-tuned ‘black and white eyes’. This additional element in the process of visualisation can be incredibly demanding. Incredibly, Chase is a high-school senior from California: his young years clearly belie his gifted vision. 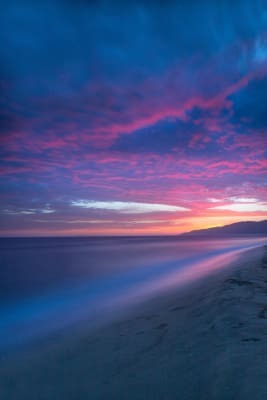 Here’s an image celebrating a rare twilight treat, this is what happens when the low lying sun up-lights a mackerel sky and Chase captured this beautiful colour palette in Malibu. Chase has captured and processed all one hundred and three seconds of this beautiful moment perfectly. The Big Stopper has stretched time by the perfect amount to blur the water and the cloudscape in a scene which probably hasn’t changed much for millions of years. 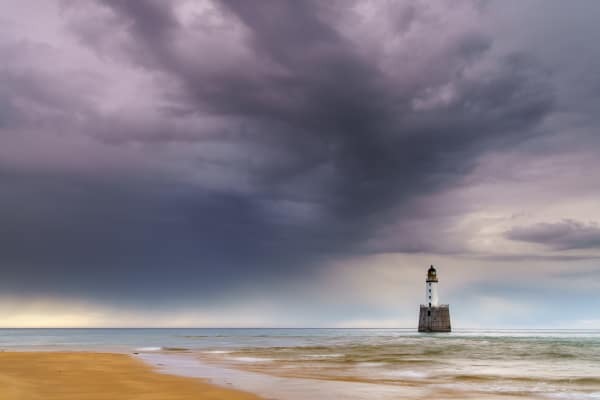 Brian’s image resonates with me at a guttural level, he’s translated the essence of how it feels to be standing there at the coast with an approaching storm perfectly. I love the way he’s emphasised the texture in the brooding cloudscape, helped by the judicious placement of the 2-stop ND Grad while on location and masterful processing in post-production. The colours are cooked to perfection and seasoned with just the right amount of saturation to delight the most critical palate. Colour is probably the single most important thing to get right in colour photography and Brian’s colour grading is fabulous. Jose’s image is a blatant photographic celebration of an iconic location juxtaposed with a blazing crepuscular colour palette. This is an image that instantly grabs your attention, but also becomes increasingly engaging the longer you look at it. It has both ‘wow-factor’ and ‘staying-power’ and that is a rare combination. 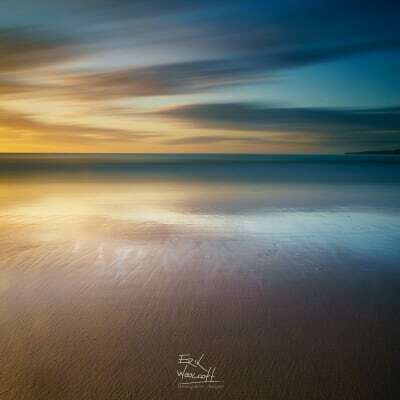 The composition is a powerful heady mix of teal and orange, and the exposure facilitated by the Big Stopper is the optimum length to dynamise both the water and the cloudscape to the perfect degree. 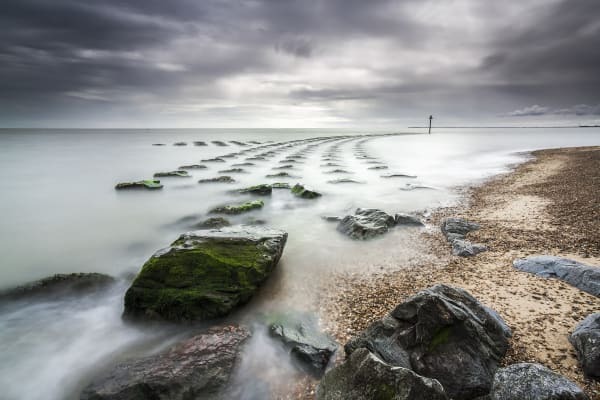 Robert Canis is a professional nature photographer living in Kent, England. 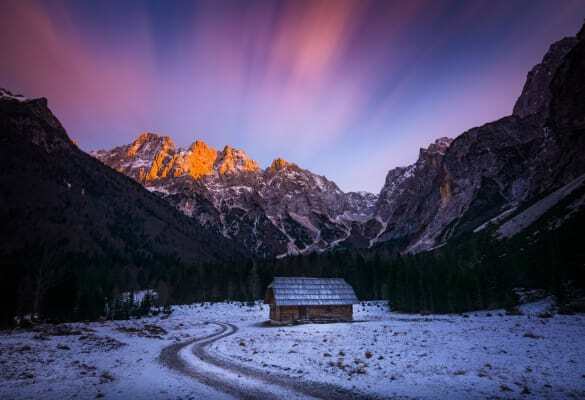 Although a great percentage of his personal work is undertaken near to where he lives, over the years he has had a growing fascination with photographing the landscape and wildlife of northern and eastern Europe. 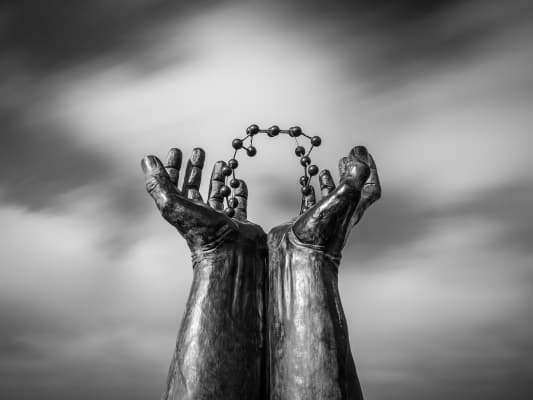 A frequent contributor to the photographic press, his work has received numerous awards and he is the recipient of the Royal Photographic Society’s Gold Medal. Robert has been a guest speaker on numerous occasions (including at the Scottish Nature Photography Festival) and runs a wide range of workshops and overseas tours to such locations as the Peak District, Exmoor, Iceland and Lapland. As much as he enjoys tutoring he is mindful that he is, first and foremost, a photographer with the need to fuel his creativity, and so always puts time aside for his own photography. 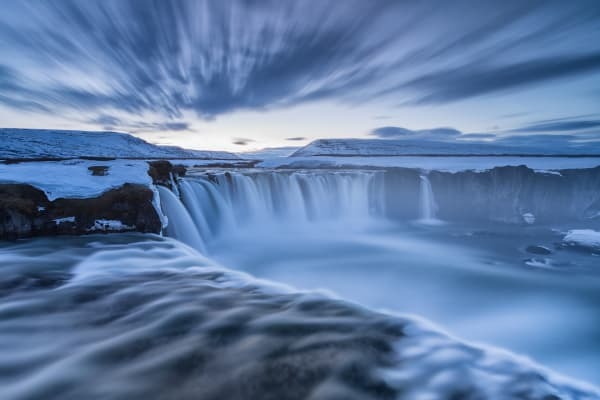 Iceland has become incredibly popular over the last few years and taking original images is now very difficult indeed. The photographer here, however, has achieved just that. Beautiful light and subtle processing has enabled this to stand out from the crowd. The more you look at the image the more detail you can see, including the faint wisp of mist on the hillside. A very dramatic image that has bags of atmosphere. 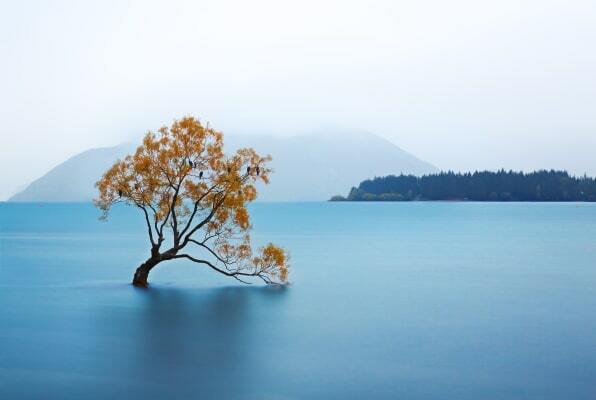 Patterns created by the water, brooding sky and a solitary tree make this a very powerful photograph. Upon looking through the image data I noticed an aperture of f/5 was used at ISO 200. I wonder if using ISO 100 at f/10 would have been preferable as not only would you have achieved greater depth of field, but through using a lower ISO the image would exhibit even greater rendition. 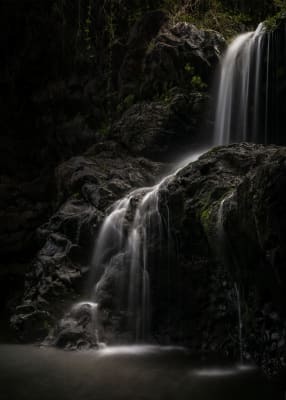 If you were concerned about the length of the shutter speed, I have found when photographing fast flowing streams and rivers there is barely any noticeable difference beyond 5 seconds, so this would not have been an issue. 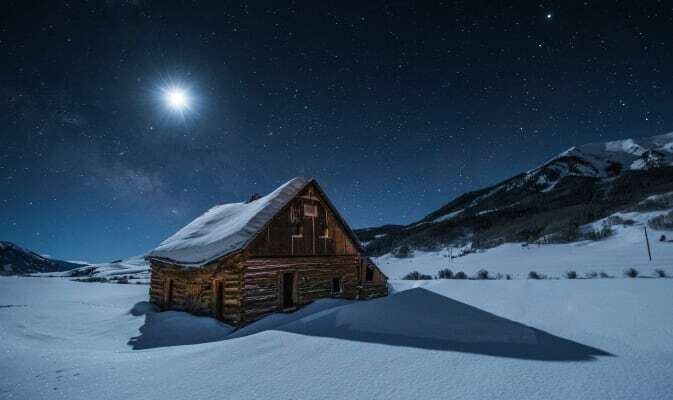 This photograph illustrates the kind of conditions us landscape photographers yearn for. And, when they occur, all we can hope is that we are in the right place when it happens. Rahul has achieved this! 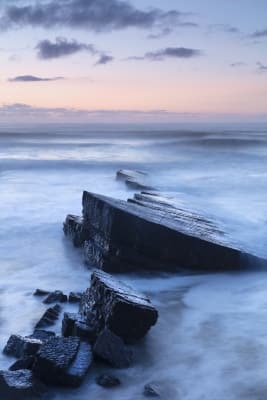 I very much like the strong foreground and use of the ND filter to create softness in the water which helps accentuate the texture in the rocks. If ever there was an example of when and how to use a Super Stopper, this is it! The subject lends itself, perfectly, to this kind of imagery where simplicity is key. The curve of the pier concluding with the lighthouse make for a very effective and strong composition. If an ND hadn’t been used I fear the texture in the water would have conflicted with the lines and details of the structures. As it is the water has been reduced to ‘silky-smooth’ and the clouds, although blurred, still exhibit enough texture to provide interest. 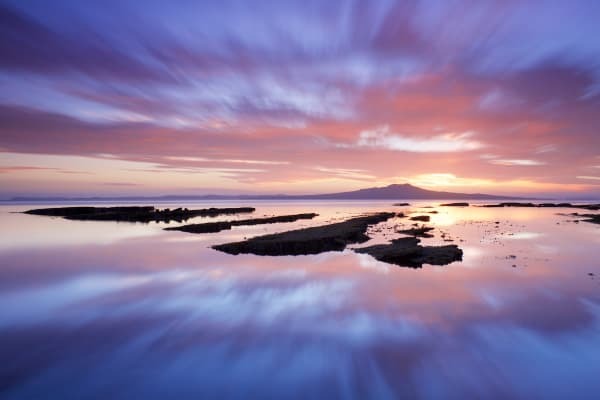 For some time the use of ND filters has been very much in vogue with, occasionally, very little forethought as to the how it will affect the mood of the resulting image. The Big Stopper invariably seems to be the first port of call while, of course, there are several others we can reach for. Colin has used my personal favourite (the Little Stopper) which has produced just the right amount of movement in the clouds and although the water is smooth it has still retained definition. The foreground is strong with the rocks leading to the sun. I am a great believer of getting it right in camera rather than relying on too much manipulation in post production. I seek, in my image making, to record the landscape as it is, and to photograph it naturally and beautifully. Aside of photography, my greatest passion remains travel and I am at my happiest whilst exploring the great outdoors with my camera. This is a location I know very well from running workshops in Northumberland, and it’s one of my favourite with these fabulous large pebbles in the foreground. Having made a few attempts at this type of image at sunrise myself, I know how difficult it is to achieve – not only because the rocks are super slippery but also to capture the water in the right place at the right time! Colin has done well with his timing as wet pebbles are key here and I love the light on them and the overall contrast of the warm and blue tones throughout the image. This is a simple yet highly effective image that caught my eye. 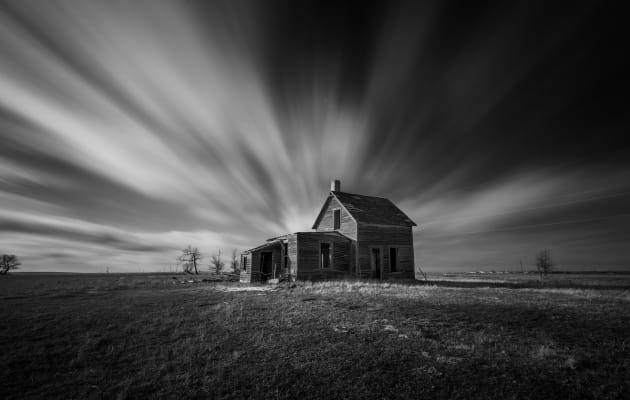 I am not a fan of extreme movement in clouds, but I think Craig has got this just right with his 10 second exposure. Had the clouds been more defined they might have proved to be a distraction. Another simple yet highly effective image which is excellently composed and clearly well thought out. Although I feel that this could also work well in monochrome, the combination of warm and cool tones is lovely and gives a softer feel, especially with consideration to the hardness of the urban structure. Wow – look at those mountains! The fantastic foreground interest along with that wonderful red glow on the side of the mountain really make this image for me. The use of the ND Graduated Filter has helped to control the exposure on the sky and darken it down just enough to help contain the eye within the main body of the photograph. This image has, not only great subject matter, but a wonderful sky which has been successfully enhanced by the use of the 0.9ND Grad to reveal the wonderful texture of the clouds. 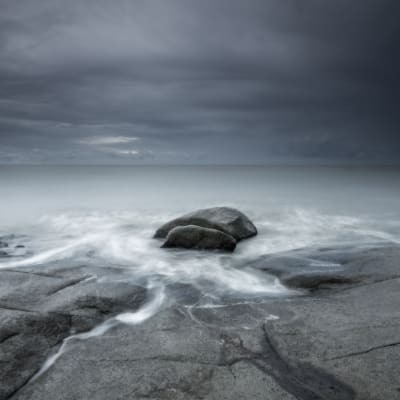 The result is a dramatic, moody feel with fabulous light on the water and foreground boulder. I also particularly like the movement in the water around the boulder although I wonder if a little could be cropped off the bottom of the photograph, without destroying too much of that lovely wave movement. 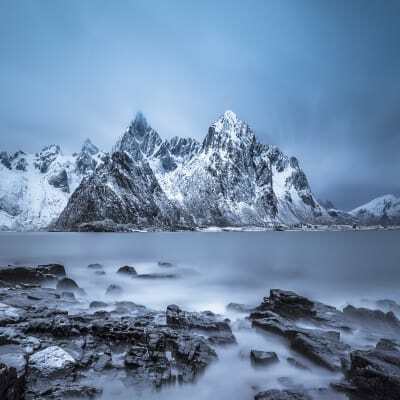 Craig Roberts is a travel and landscape photographer and has been shooting images for magazines, stock libraries and calendars for over 20 years. His work covers both the rural and urban landscape and he has his own YouTube channel (e6 vlogs), where he talks about his technique of shooting landscapes to an ever-growing audience. He also runs workshops and unique online photography courses for both beginners and more advanced photographers. His website e6 subscription service offers exclusive videos, plus technique eGuides, ebooks and image reviews. For more information please visit: craigrobertsphotography.co.uk or visit his e6 Vlogs YouTube Channel. I had a few long exposure shots to choose from this month, some better than others and whilst some can be very cliché, others, despite maybe also being a little cliché, just work! So, Jeremy's offering here caught my eye, but there's good reason too. Yes, there's lovely colour. Yes, there's movement. But both these compliment the other subjects in the frame. He hasn't chosen to use the long exposure technique just simply because nothing else would work and that's key. The lines and movement in the sky add drama, add impact and yet also draw the eye to the main subjects. Those wonderful rocks echo these motion-led lines in their static form. They all lead to a single main subject in the background, the mountain. Well, here's an example that illustrates that not all long exposure shots HAVE to be taken at the coast with the sea as the main subject! 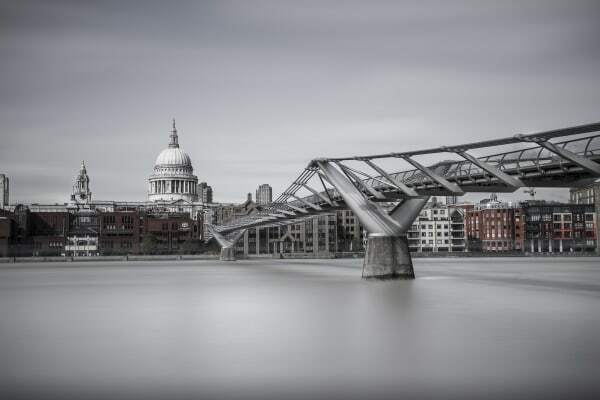 A combination of Big and Little Stopper filters has given 15 stops ND effect, giving the River Thames a surreal softness. The diagonal of the Millennium Bridge could have been enhanced by a slight crop to the left hand side of the frame and the image looks like it is a black and white conversion, but with some colour pop on certain areas. Not required in my eyes. Whilst there are many images and views that benefit from a long exposure to add blur and movement to a scene, this isn't one of them! What this image does have however, is great foreground and lots of it. This is emphasised by the high position of the horizon. Perfect. 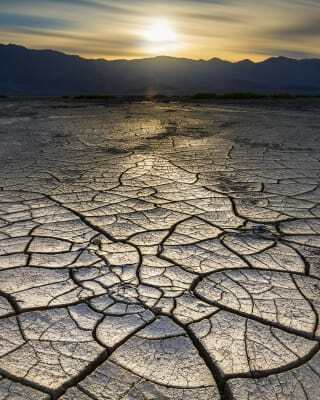 What Brent has done here however, is try to enhance the landscape of Death Valley by blurring the clouds in the sky. So, instead of complimenting the landscape below, it's now competing with it. The most effective landscape images consist of shape, form and light. Capture this with just the right filter to enhance or balance what you have and you have a winning result. Iain has used just a Polariser here to enhance his scene and it's the shape within the frame that has caught his eye. The warm light on the dunes is wonderful, but the little S-shape being created is even better. The water gently snakes its way up the frame, leading the eye to the mountains beyond. A side step to the right, would have cropped out some of the main dune top right, where the composition does feel a bit 'loose' and this would have also probably allowed the main mountain range a bit more 'breathing space' to its left. What intrigued me about this shot by Andy, was not only the impressive subject, but also the filter choice for the image. For this picture he used a warm up filter as well as an ND filter (grad I'm presuming). In the digital age, the warm up filter has almost become obsolete by the White Balance control, allowing us to warm up (or cool down) our images to our hearts content, either in-camera or during post. That's not to say you can't still use the 81 series filters over the lens and whilst Andy's may just happen to be an all-in-one warm-up/grad filter, I'll give him the benefit of the doubt that it was a calculated choice to warm this scene up. 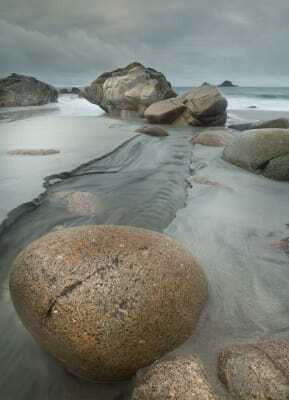 Joe Cornish has been a working photographer for thirty five years, most of which have been devoted to travel and especially landscape. Current work includes his own photography, workshop leading, book commissions, writing, printing… and gardening…while struggling to come to terms with the inevitable contradictions of being a photographer who has to travel, and a committed environmentalist (who should probably not). An Honorary Fellow of the Royal Photographic Society, Joe is now Chair of the Fellowship Committee. Based in North Yorkshire he is also a Trustee of the North York Moors National Park Trust. Depth is such a fundamental consideration in landscape image making, and good composition and viewpoint make a huge difference to the evocation of depth. 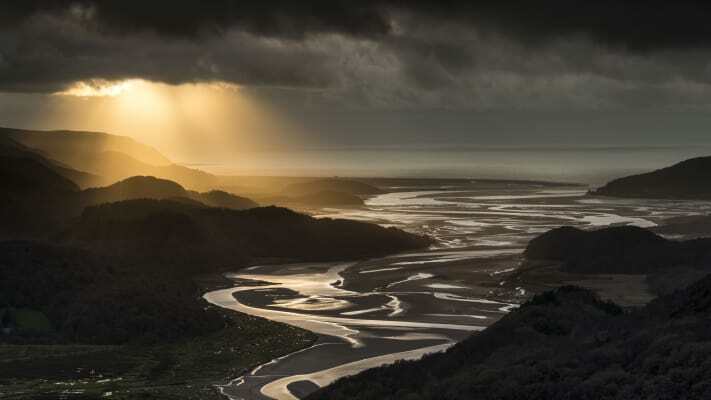 One might think that with all the raw materials - stormy and dramatic lighting, the sinuous receding lines of a braided river bed, and an outstanding viewpoint - that a good photograph would be guaranteed. But to bear witness to a moment like this requires effort and endeavour; it rarely happens by accident. And there are still judgments to be made in composition, exposure and post-production rendering. It is particularly difficult to make some sense of English heathland, a habitat which is usually lacking in significant features and focal points. Yet if this is where you live and enjoy being outdoors close to home it will mean a lot to you, and so finding ways of interpreting its charm and beauty is a worthwhile challenge. What intrigues and mystifies me about this image is, it seems to be a frosty winter morning, yet the ling heather in the foreground appears to be in flower, a state normally associated with August! Whatever the event, the delicacy of colour from the light is wonderfully evocative and works perfectly for the heathery landscape. The sunrise illuminating the mist gives a contrasting colour note and depth to the landscape. 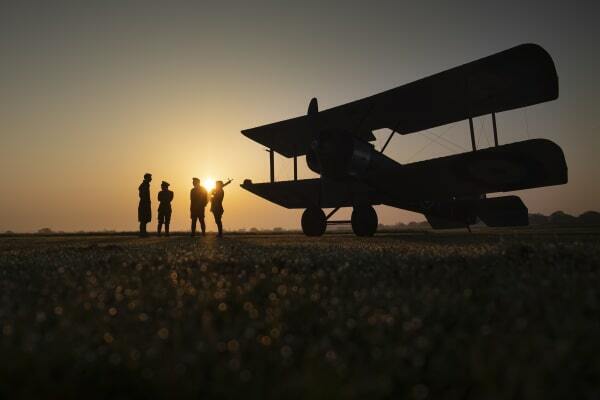 David Noton, a renowned travel and landscape photographer, runs his own highly successful freelance photography company from his base in Milborne Port, near Sherborne on the Somerset/Dorset border. He also publishes the acclaimed f11 Photography Magazine. His passion for photography, travel and the world’s most beautiful locations are the defining influences that have shaped his life, work and creative approach to photography. In his 33 years as a roving professional photographer David has travelled to just about every corner of the globe. His images sell all over the world, both as fine art photography and commercially in advertising and publishing, and his clients include Canon, the National Trust, the Royal Mail and BBC Enterprises/Lonely Planet Magazine. In addition, he has won international awards for his work that include the British Gas/ BBC Wildlife Photographer of the Year Award in 1985, 1989 and 1990. 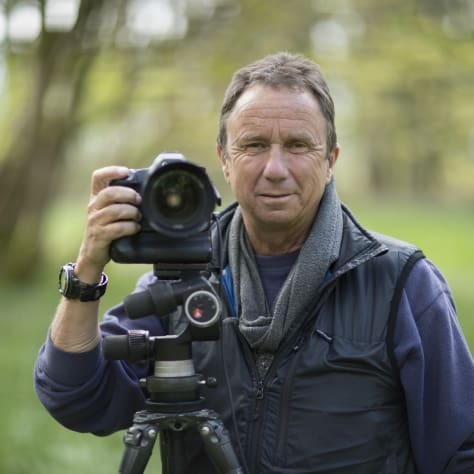 David is also a widely published writer, author, presenter, tutor, and film maker, a Canon Ambassador, a Fellow of the Royal Photographic Society, an official Adobe Influencer and a brand Ambassador for Manfrotto. For more information please visit: www.davidnoton.com and take a look at his f11 Photography Magazine. This is the kind of picture that makes me want to put my boots on and hike over the hills and far away. It also makes we want to load up and head north for Scotland. And surely that says it all; pictures that evoke those kind of reactions have surely succeeded, haven’t they? I love the depth to this picture, and the balance between the foreground interest of wonderfully textured rocks and the distant sweeping landscape. I also like the muted, subtle colours and the bright, high key feel; I see far too many dark moody landscapes which look fine on a glowing monitor in a dark room but just dingy and sombre as prints on the wall. I love minimal colour images like this. Sweep your eye from corner to corner; the only colour present is the blue of the boat contrasting with the yellowy/brown of its rotting timbers. The subtle use of colour is one of the hardest things to learn in photography I believe, maybe its intuitive, but Jean-Yves has managed it with this powerfully observed image. The best images are always the simplest, a point this picture illustrates well; there’s nothing in the frame that doesn’t deserve to be there. I know from long experience of judging pictures and competitions that the eye quickly becomes weary of formulaic photography, so when something different crops up it immediately attracts attention. This picture jumped out at me. Don’t get me wrong, I wouldn’t want it on my wall; I’m not sure I like it at all, but it certainly says something about the bleak environments that we’ve created for ourselves on the fringes of city centres. The use of the Big Stopper ND has blurred the traffic trails nicely, they’re compositionally key to the image after all. The motion blur in the clouds is not too much; any longer and they’d become a mess. With texture in a sky like that why loose it with too long an exposure? Dappled light on the landscape is so much more dramatic then blanket illumination, isn’t it? This is a wonderfully atmospheric picture. 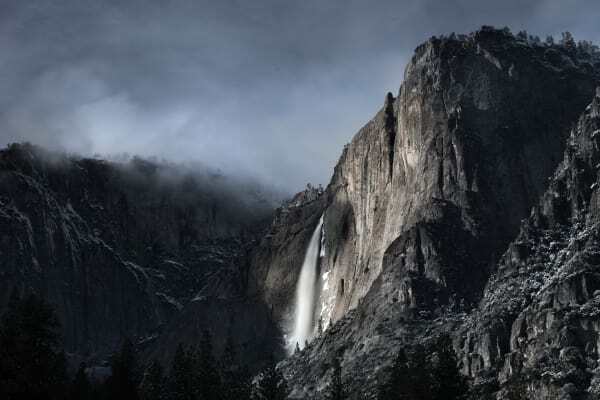 OK, Yosemite is epic, we all know that, but the most dramatic landscapes are often the hardest to shoot. To capture something special in such well known and overly photographed locations we really have to dig deep. Derick has captured an image full of dark mood here. Too dark? Those shadows on the left are awfully dense, but then again there’s beauty in a rich black. I may have teased out a bit more detail there, but I applaud Derick’s courage in embracing the darkness. Time to confess; I am tired of long exposure pictures of breaking waves. Maybe that’s heresy to admit here, but I think they’ve become a boring cliché. That’s hypocrisy on my part of course, because I have been making such pictures for decades. No longer though; I now like to capture the texture and energy of the waves, not seas of milk. What then of William’s long exposure study? Producing such images is fun, and I have to admit this is a fine example of the genre. It’s also yet another brilliant illustration of the power of minimal colour; just look at the refined use of muted blues and greys. Compositionally it’s a clean, graphic, elegant and well observed image. I love the triangular section of beach in the foreground. 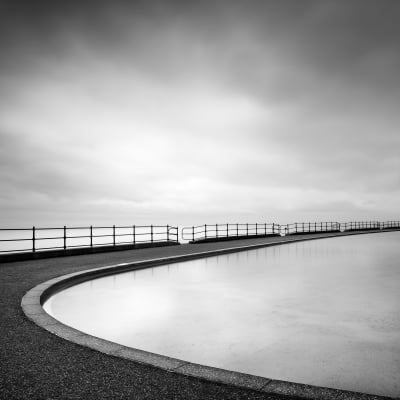 Jonathan Chritchley is one of the foremost fine art photographers in the world today. His instantly recognisable work is seen around the world in exhibitions, galleries, magazines and books, and form part of many fine art collections internationally. His regular clients include Ralph Lauren, Hilton International, Walt Disney Studios, Fortuny and P&O Luxury Cruises. Jonathan also speaks and presents his work at photography and sailing events worldwide and is the founder and owner of Capture Earth and Ocean Capture, two companies specialising in luxury photography workshops & tours. Jonathan was named one of the 'Top 100 Photographers of All Time' by the Sunday Times. His first book, SILVER, a 136-page fine art art edition, was published in 2014, and in 2016 he was made a Fellow of the Royal Geographical Society (FRGS). An active supporter of ocean conservation, Jonathan currently resides in the south of France, close to Biarritz, with his wife and young family. What an usual and abstract vision of one of London’s most recognisable attractions. It is always heart-warming to see something done differently, and that is certainly the case here. This is not a perfect photograph. The sky is a little heavy and perhaps detracts from the strong arc of the Eye; the centre of the wheel is a little out of balance. But forgetting the detail and concentrating on ‘the big picture’ and we see that this is actually a wonderful photograph. I have to admit to not normally being a fan of the oranges and pinks of sunrise and sunset, but I find the serenity and grace of this lovely photograph extraordinary. The composition is strong, the post processing discreet and the mood magical. Some might remark on the fact that the boat is pointing out of the frame, but in this case that doesn’t bother me at all. I love the space and tranquility of this very lovely scene. Mam Tor, Peak District National Park, UK. 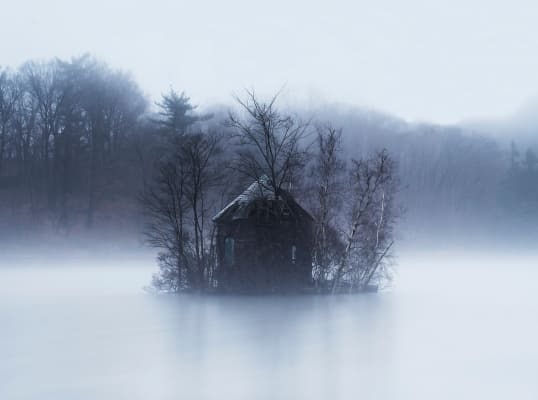 This photograph immediately stood out to me for its strong composition and dreamlike quality. 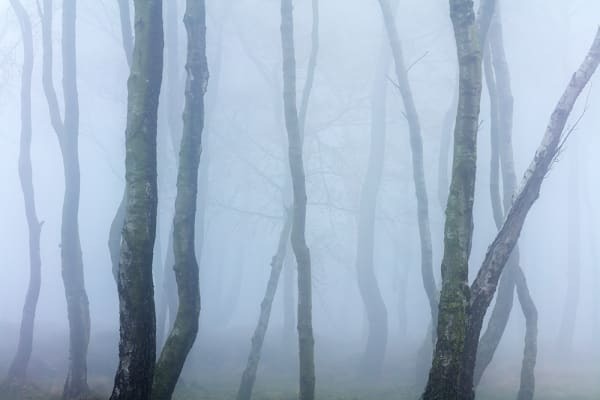 I love the fact that at first glance it seems almost abstract, and it is only when one has been studying it for a few seconds that one realises that the trees are trees and the mist is mist. 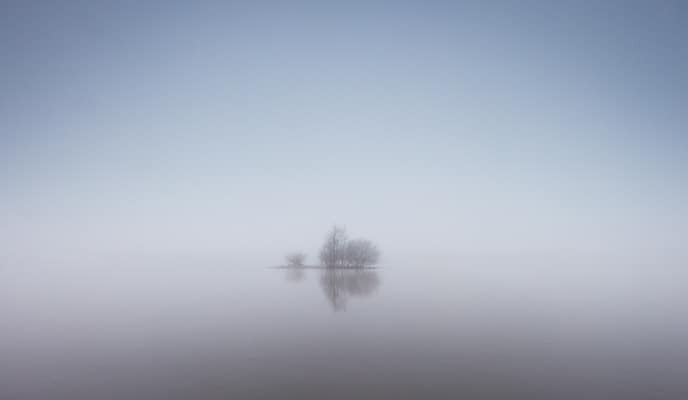 Every minimalist photographer loves a bit of sea mist and the photographer behind this well-executed capture makes very good use of it here. I very much like the thought behind the diagonal composition of the rocks, creating a well-balanced, geometrically strong image. The colours and tones are also beautifully handled; enough blue in the sea yet enough red in the rocks – actually not an easy thing to get right. 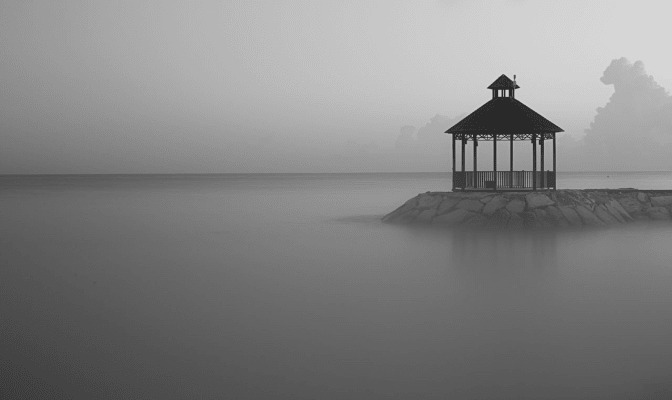 This photograph has a strong minimalist feel, and the photographer has shown great control of the black and white tones. The choice to go low key proved to be a fantastic one, as it adds to the drama and atmosphere; any other approach may have seemed a little bland, but this treatment lifts the mood considerably. 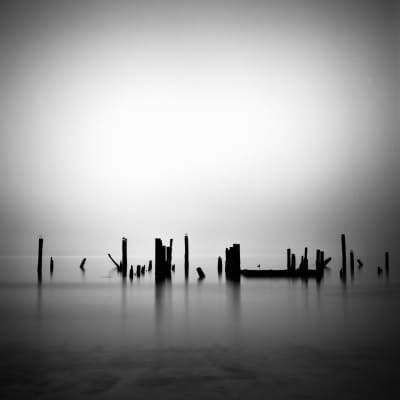 Mark Gilligan has worked with photography for over 45 years. 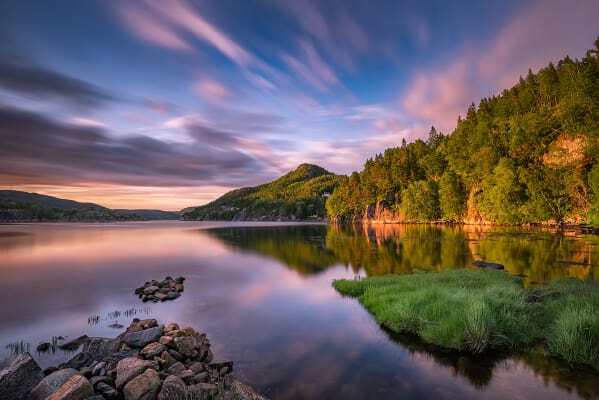 He became well known for his landscape work in the lakes and as a result was made a Fellow by the British Institute of Professional Photographers. 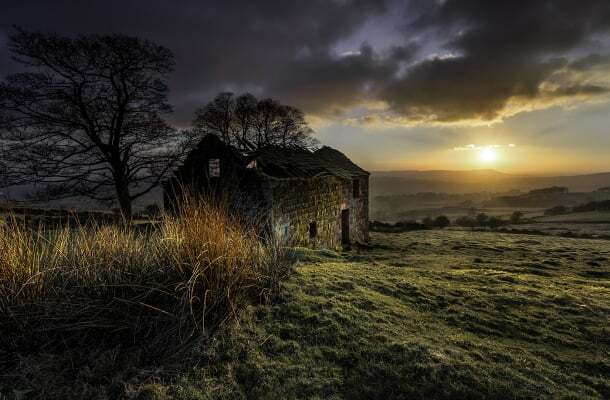 A recent winner of the Sunday Times #OMGB Award and a merited finalist in the European Professional Landscape Photographer of The Year, his images are used to promote the UK across the globe. For 35 years, Mark also worked concurrently with the Home Office as the Director for Photography and Video on their specialist national course. Trained at the BBC, he produced and directed over 150 television programmes. An ambassador for FUJIFILM, He now spends most of his time running his bespoke workshops, writing for magazines and occasionally appearing on broadcast television. This is an example of one of those images we see and think, ‘wow, I wish I had been there’. 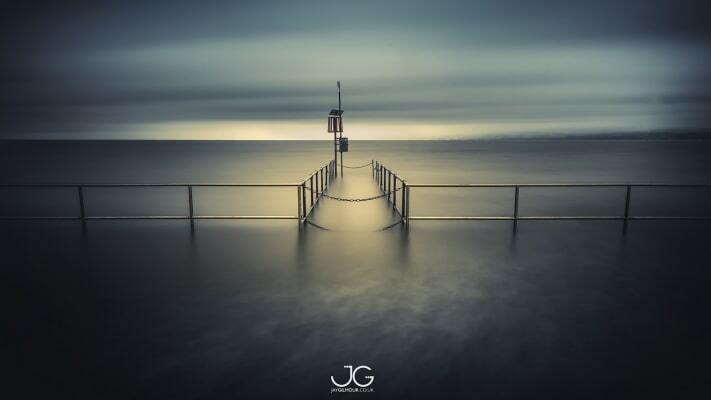 Beautifully captured by James, it exudes power and scale in a photograph that simply begs you to look at it. 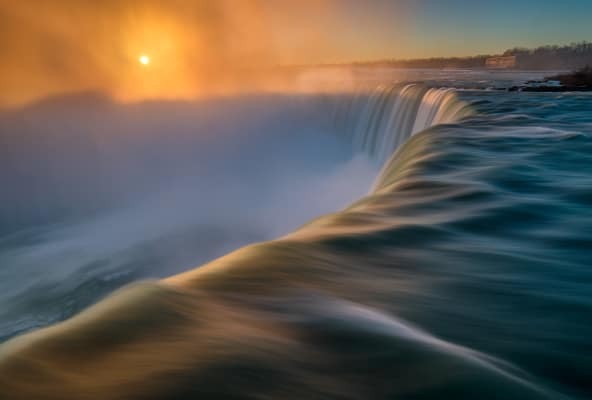 The lead in line of the falls takes you to the sun as it peers through the spray and cloud. Although there is a soft and blurry feel to large parts of the photograph, it remains powerful. 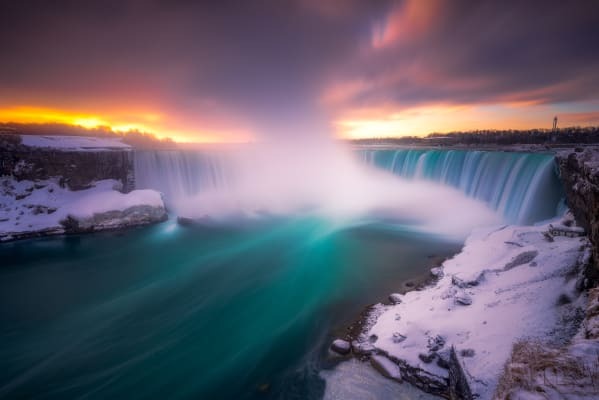 The Little Stopper coupled with a 0.6ND Soft Grad are just enough to create the effect, and you are in no doubt as to the majesty of Niagara Falls. Nature at its finest and well captured by Steve. The natural lead in lines to the tree have been carefully selected to create the ‘V’ that takes you there. Once you have been pulled into it, the level of detail has your eye scanning the frame. You want to see more and are not disappointed with what you see. Monochrome is a good choice and the way I would present this photograph. The portrait format works very well too. I was immediately pulled into the photograph by the imposing granite rock in the foreground and the strong lead in line of the channel. Rob has reinforced the power in the image by ensuring that the imposing shapes and detail in the rocks are not lost and the way the gash in the boulder follows through onto the right hand channel is excellent. The use of the 1.8 ProGlass IRND filter has rendered it true to its natural colour. I like its overall mood and purpose. David has created an image where there is just enough here to grab your attention and I say that in an appreciative way. Minimal but with enough detail to ‘hook’ you in. The mist diffuses the stronger element in the foreground then invites you to peer deeper within where the network of trees becomes obvious. Nothing is sharp here and you would expect that on such a day. It does not detract from the atmosphere. An almost monochromatic look is lifted by the barest of colour on the tree bark adding to the cold stark feel. A polariser was used to minimise sun glare on the day. 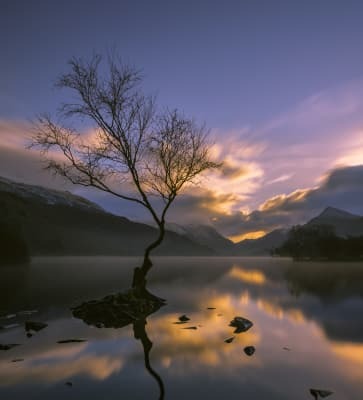 Jaromir has produced a golden hour photograph of ‘that tree’ by Lake Padarn at Llanberis, North Wales. I like the way its branches mimic the mountain's natural line on the left-hand side of the frame. Uncluttered and with everything pulling you towards the head of the pass way in the distance. 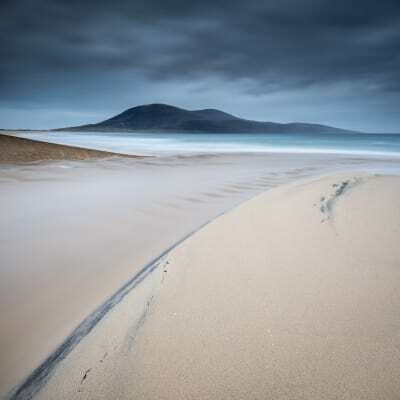 Ross Hoddinott is one of the UK’s leading outdoor photographers. A professional for over 20-years, Ross is a multi-award winner and the author of several photography books, including ‘The Landscape Photography Workshop’ and ‘Art of Landscape Photography’ (both with Mark Bauer), ‘Digital Macro & Close-up Photography’ and ‘Masters of Landscape Photography’. Ross is an ambassador for Nikon UK and Manfrotto and co-owns Dawn 2 Dusk Photography, who run landscape photography workshops across the UK. He also offers bespoke 1-2-1 guidance. He lives in North Cornwall with his young family and has been using Lee Filters since his teens. I had to pick this shot. First and foremost, it is a lovely image, but secondly it is a location I know and recognise, being just a short drive from where I live. As you may already know, I love simplicity – clean, uncomplicated compositions. Therefore, it is unsurprising that this photograph appeals to me. I’ve long evangelised about the importance and effect of using filters, but confine myself to a Polariser, ND Grads and Stoppers. I probably shouldn’t be saying this, but I’ve always considered other filter types unessential, or even gimmicky. 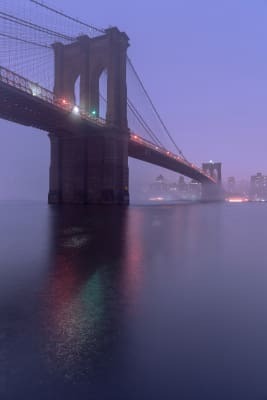 However, Frederico’s image is a good example of how a Mist Stripe can enhance certain scenes. Jökulsarlon in Iceland must now be one of the most photographed places in the World – and it is not hard to understand why. 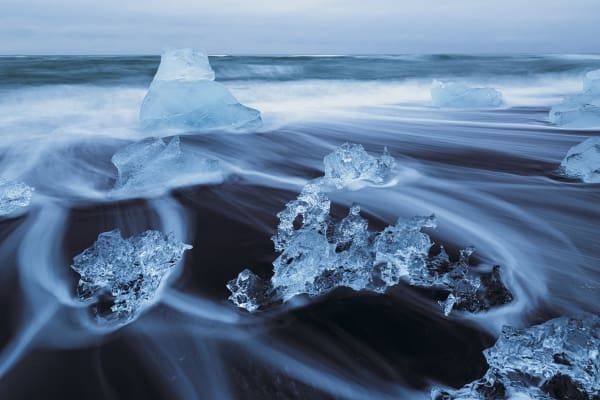 Chunks of sculptured ice lie on black, volcanic sand – for landscape photographers, it is like being a kid in a sweet shop. Just because it is a well-photographed location, doesn’t mean it is an easy place to take good shots. In fact, as a photographer, you have to work even harder to capture a standout image. I think Reinhard has done just that, though. 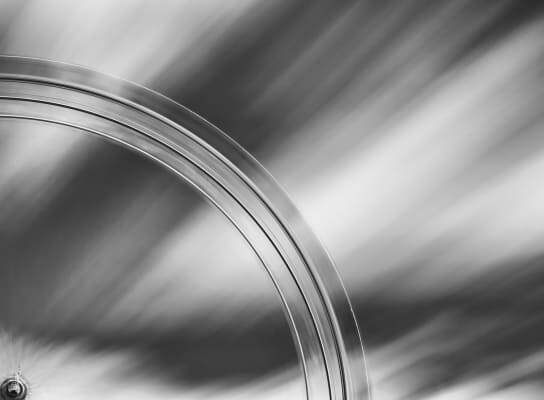 The length of exposure – generated by the use of a Little Stopper – has created lovely motion. Timing was key in this instance – Reinhard triggered the shutter at just the right moment, as the backwash rushed around the cool blue ice. Just like Adam (Burton) last month, I’m not known for being a black and white fan – I much prefer colour. I rarely convert my own images, but it is a powerful, timeless medium and this shot really caught my eye while judging. This is a lovely seasonal image. The warm autumnal colours, mirror-like reflections, and wisps of mist collaborate to produce the type of conditions that make landscape photographers go weak at the knees. The tight composition is effective and I like the way David has framed the main, central trees with the river bank either side. The use of a polarising filter has really brought those seasonal colours alive, while enhancing the reflections. 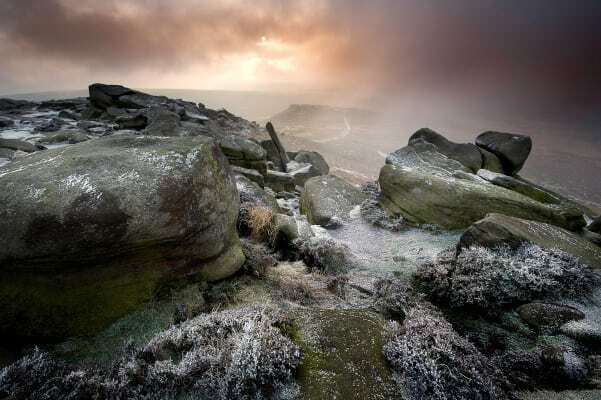 Adam Burton is one of the UK’s leading landscape photographers. A professional photographer, teacher and author with over fifteen years experience working within the landscape photography industry, Adam’s images are always in-demand; his client list includes many prestigious organisations such as National Geographic, Ford and The AA. Adam runs small group workshops under his Discovery Tour brand, and also leads regular workshops both in the UK and overseas on behalf of Dawn 2 Dusk Photography, Tatra Photography and the Nikon School. For more information please visit: www.adamburtonphotography.com. Tomasz has captured a fine photograph of a very beautiful building here. The warmth of the tangerine sunrise is incredibly appealing as is the softness thanks to the misty conditions. The soft ND Grad has done a fine job in subtly retaining those warm colours in the sky, leaving the viewer to admire the picture without noticing any filtration, just as it should be. The composition is simple, yet effective. The smallest hint of a footpath leads the eye towards the church, and attention is naturally drawn up to the windows in the tower, where that irresistible glow completes the picture. Another black and white makes my shortlist! And this is another example of an image working really well without colour. 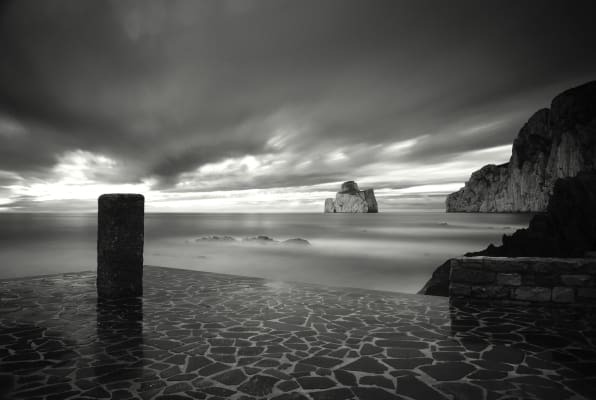 I absolutely adore the wet mosaic tiles in the foreground; their shapes are incredibly appealing in B&W. In fact there is strong interest throughout the whole picture, yet the composition remains very balanced and uncluttered. You can tell Gianluca has considered this composition very carefully, it simply works. This is another example of how a long exposure can be very effective in a coastal photograph, however; personally I think a 5 minute exposure was maybe a bit longer than was necessary to achieve this effect. I’m surprised to see a Little Stopper was used to achieve this shutter speed. Even with a polarizer, I wouldn’t have thought such a long exposure could be achieved at this time, so perhaps Gianluca used a Big Stopper instead? I’m often telling people that colourful sunrises and sunsets aren’t the be all and end all to landscape photography, especially at the coast, and this image shows that really well. I’m sure Emanuel would have happily accepted a colourful sunset sky, but the muted colours he has captured on this cloudy day work excellently. 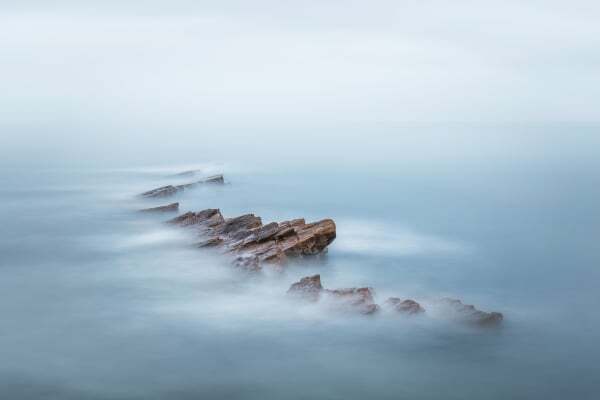 The sea defences make wonderful subject matter for a seascape, and especially a long exposure, which Emanuel has achieved with a Big Stopper. I’m not sure I would have used such a strong graduated filter here; the 0.9 hard edge has made the sky very dark, which is appealing but possibly unnatural. I think a 0.6 hard edge grad would have done the job perfectly well here. As soon as I first saw this photograph it grabbed my attention. It’s such a simple composition, which also breaks some compositional rules, and yet it works magnificently. You could argue that the mountains are placed centrally in the frame and there isn’t any obvious foreground interest, but rules were made to be broken. I simply love the black brooding mountains, broken up by the shards of light piercing the dark slopes. That green water captivates me, the colour is incredibly appealing, and despite using a Big Stopper to achieve a 20 second exposure the water remains nicely textured. 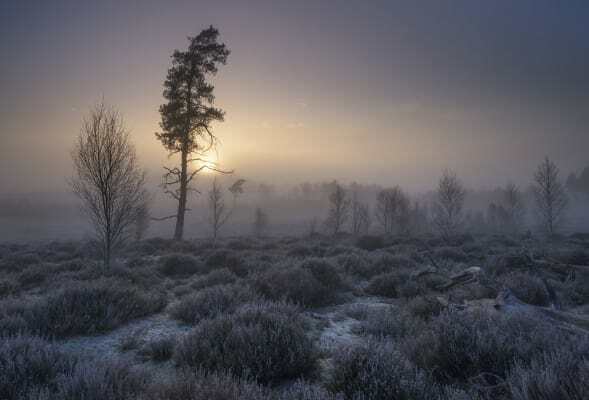 Justin Minns is a professional landscape photographer, his work is all about using the best light and conditions to capture the spirit of a location and he is known for his atmospheric images of East Anglia. 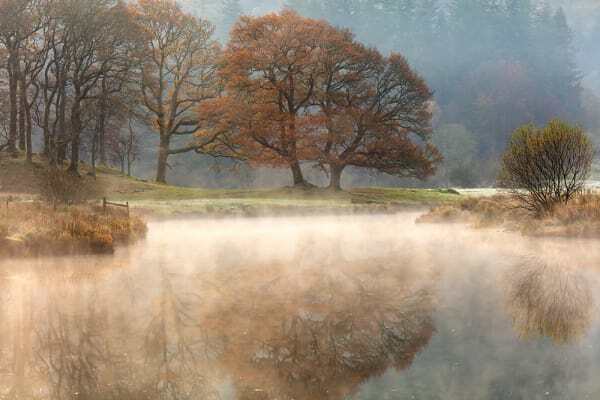 Justin's landscapes are widely published and he is regularly commissioned to produce images for the National Trust. 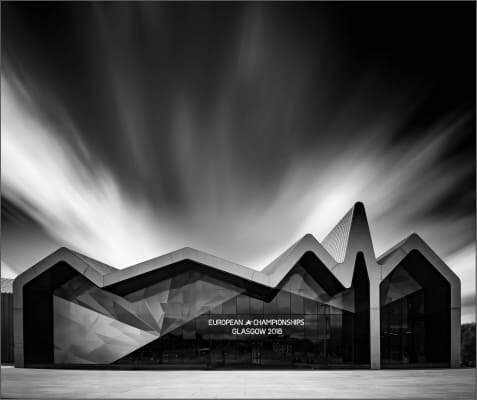 His work has also been recognised in several major competitions, including Landscape Photographer of the Year with his images appearing on the cover of the accompanying book on two occasions. Justin’s first book, a guide to photographing East Anglia is due to be published in 2018. Justin has been running his 1-2-1 and group workshops in East Anglia for several years and also leads group workshops further afield with Tatra Photography. This one was first on my list, there’s just so much to enjoy in this calm image. 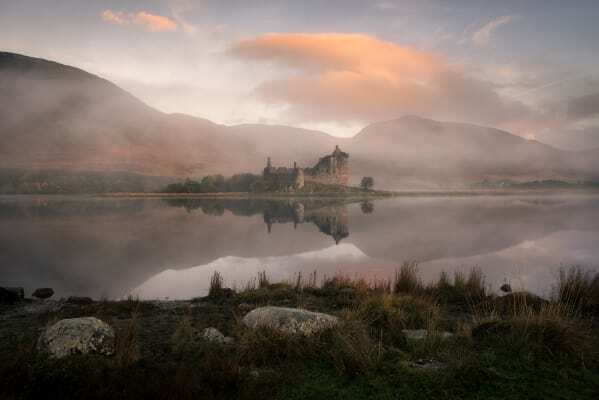 From the contrasting textures in the rocks and grasses in the foreground to the softly lit, mist shrouded castle reflected in the water, all against the backdrop of those hills. The 0.6ND Medium Grad is one of my favourite filters and it has been used to great effect here to balance the sky and foreground without unduly darkening the mountains, keeping everything looking natural. This is a fascinating image with so much more going for it than the unusual conditions. 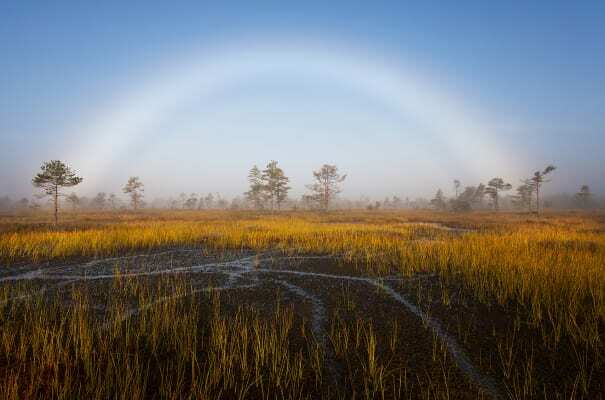 The composition is excellent with the grass providing foreground interest while the patterns made by the water lead you gently into the frame towards the trees and of course the fogbow. The combination of a Hard ND graduated filter and a Circular Polariser have worked well, the grad retaining contrast in the sky while the polariser has emphasized the effect of the fogbow as well as boosting saturation throughout. I love the power in this shot, you can almost feel the spray and hear the roar from the Dynjandi waterfall cascading down the rockface. 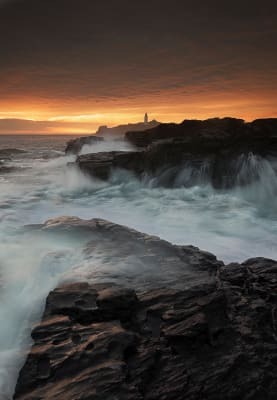 The inclusion of a lone figure on the rocks gives us a sense of scale and they’ve been positioned perfectly to stand out against the background of the white water in the bottom right third of the picture. A Little Stopper has been used to slow the shutter speed, giving the water a soft silky appearance which contrasts nicely with the hard jagged rocks and the high contrast between those dark rocks and bright water has been handled well, with no blown highlights in the white water, but I’d like to see a bit more detail in the foreground rock. I love dramatic seascapes and this one is superb. It has been well composed using the streams of water coming in from the bottom corners to lead the eye into the image and the wide angle lens puts the emphasis right where it needs to be, on the swirling water in the foreground. It’s the choice of shutter speed that makes the image for me though, with just the right amount of blur to capture the motion of the water without losing too much detail. Another fantastic seascape. I love the quality of light and the contrasts between the soft textures of the sea and sky against the harshness of the rocks, the subdued cool tones against the watery warm light. The slow shutter speed, courtesy of a Little Stopper is just right, softening the water but crucially leaving some texture to hint at the power in the waves while a 0.6ND Hard Grad similarly, balances the exposure without going too far. Steve Gosling is a professional photographer who specialises in producing creative & contemporary landscape and travel images. 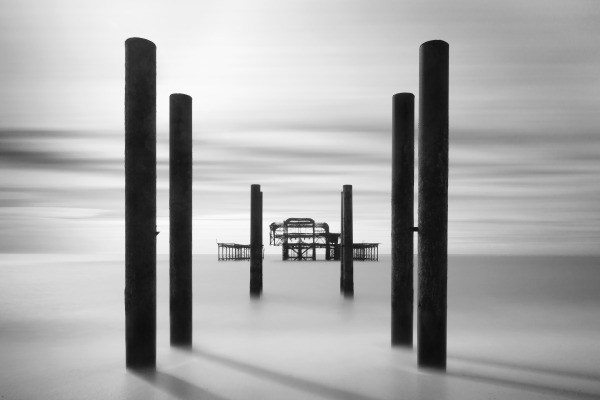 His work has won many awards - for example, his landscape images have been successful in the UK’s ‘Black & White Photographer of the Year’ competition and for the last 3 years he has had images shortlisted in the prestigious international 'B&W Spider Awards', achieving an Honourable Mention in 2016. 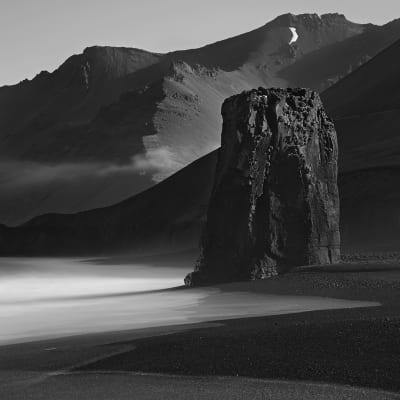 He has run a successful workshop programme for several years in locations across the world from Iceland to Antarctica, encouraging and inspiring photographers of all levels. As well as working closely with Phase One and Lee Filters Steve is an Ambassador for Olympus, Manfrotto/Gitzo tripods & Permajet inkjet papers. I love the simplicity and minimalism of this image – it’s a great example of the reductionist approach to composition that I advocate i.e. taking out everything that doesn’t contribute to the core message of the photograph. 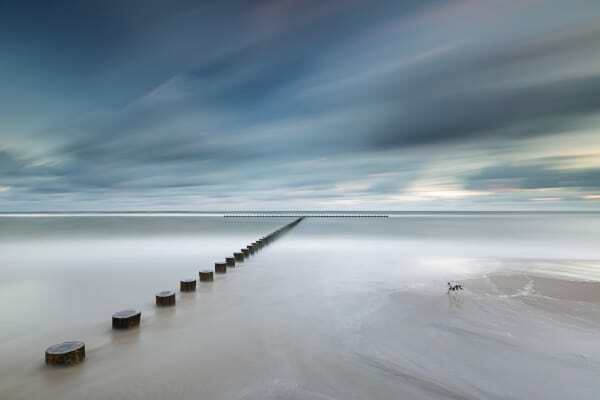 A Big Stopper combined with a 3 Stop ND filter have been used to good effect. The long exposure has emphasised the graphic composition and the movement & texture in the clouds gives a feeling of energy and dynamism. There’s also a lovely range of tones (important in a B&W image like this). 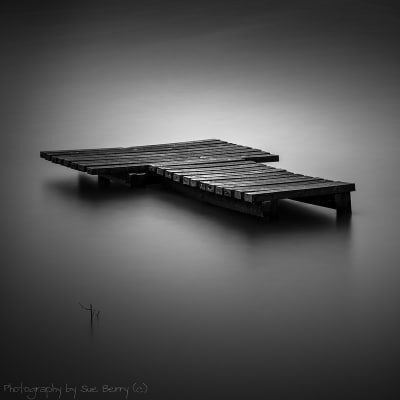 Again, this striking photograph demonstrates less is more – it’s the simplicity that gives this image its strength. The light quality, tones and colours are superb – I particularly like the cool and warm colour contrasts – and the textures on the sand give a real strength to the foreground. The use of a 17mm focal length has emphasised the foreground and shooting at f/11 has given great optical quality making the most of the textures on the structure. The use of a Big Stopper to extend the exposure has smoothed the water ensuring that it doesn’t distract from those textures. 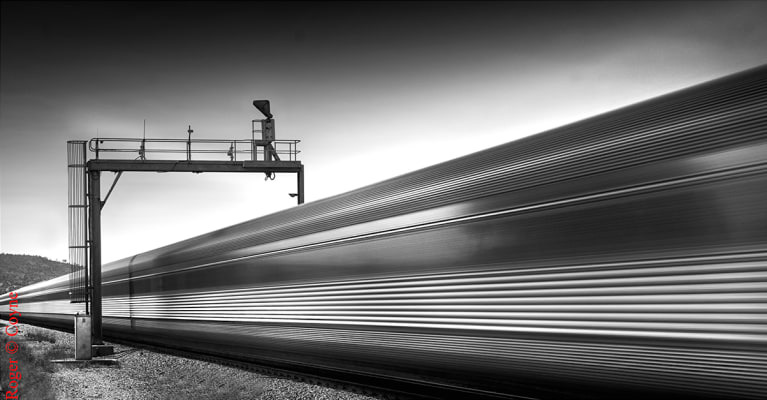 Importantly the 480 second exposure has also allowed the hint of the rails under the surface to appear. 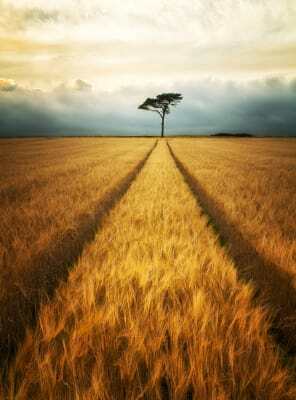 A beautiful photograph that is well composed with the tree placed close to the centre of the image towards the top of the frame and the lines in the field leading up to it. The warm colours of the crop (a vital factor in the success of this photograph) have been enhanced by the use of a Polarising filter and an ND Grad has held detail in the sky. I love the flowing, curving lines in this composition that sweep the viewer through the image. The attention to compositional detail has been good e.g. the separation of the top of the foreground on the right from the line of the river beyond is important. The exposure has been well handled to prevent the distant headland from recording as a featureless silhouette, helped by a 3 stop ND graduated filter to darken the sky and bring down the contrast range. This was also aided by the timing – taking the photograph just as the sun starts to sink into the cloud below has reduced its intensity. A Little Stopper has given a 50 second exposure, just enough to record some cloud movement and provide some interest in the sky. Chris Ceaser kindly made the selections this month. Chris is a professional landscaper who works out of his York gallery in the U.K, which he opened in 2012. He has been running photo courses for over 12 years in locations in the U.K and mainland Europe, offering small group workshops and holidays, 1-to-1 tuition and bespoke courses for those looking for something tailored to their own taste. He is also an award-winning lecturer and gives talks on landscape photography at camera clubs across the country. Based in the north, his portfolio reflects the varied nature of the landscape that region has to offer, though you will invariably find him shooting further afield as he continues to explore major cities such as London, Venice, Prague & Rome. 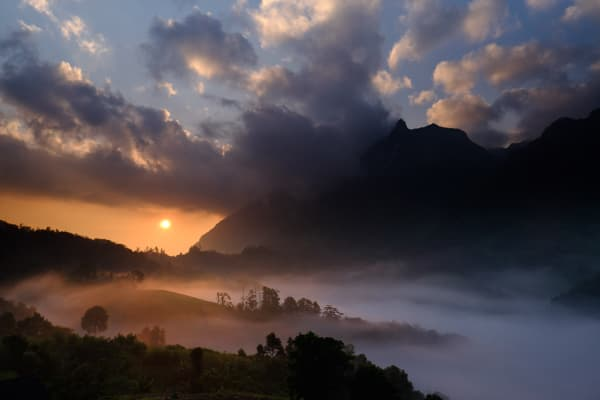 Like all landscapers, light is critical when it comes to making those precious images, and the LEE system has been his choice of filter throughout his career. This is a lovely image in the traditional landscape format. The composition is well balanced, and the eye is led from the leading rocks, with that lovely soft light, through to the dramatic clouds in the distance. The use of the more forgiving 0.9 ND Soft Grad has really balanced the exposure whilst not affecting the tower of the lighthouse. One aspect I particularly like is the area of flowing water in the foreground. The use of the LEE Polariser has cut through the UV light, allowing the foamy areas to stand out. The Little Stopper has worked well here also, leaving just enough detail in the rushing waters to add impact. 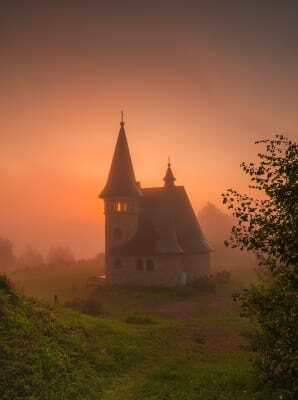 I was drawn to the subtlety of the light in this rather mystical image. The Little Stopper has worked a treat here, creating enough of a sensation of movement without losing areas of detail in the water, detail which may have been lost with a longer exposure. Cropping out the sky has eliminated the need for filters in that area. This image really caught my eye. The composition is stunning. 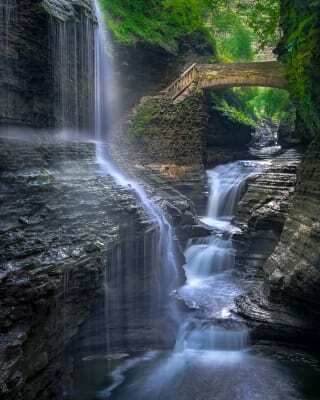 There is a natural flow to everything, starting with the curved rocks at bottom of the image. 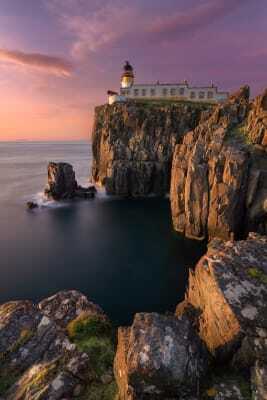 From here the eye follows the curvature of the cliff edge to the lighthouse itself. Deciding to frame the image at the bottom with the rocks themselves is very effective and provides a clean starting point for the viewer. 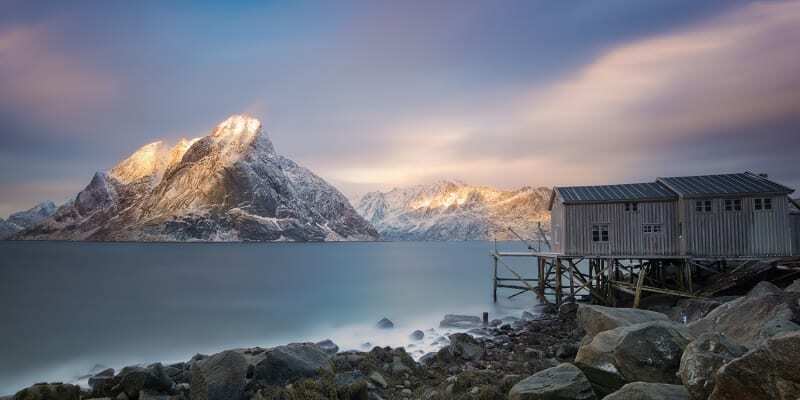 A striking image of Lofoten in Norway. The letterbox composition works well here, with the image seemingly divided into a lighter and a darker half. A 0.6 ND Soft Grad has helped balance the exposure, though there are a couple of overexposed areas on the mountains. Maybe a 0.9 ND Medium Grad might have been better in this case. This is an extremely vibrant image with lush colours throughout. 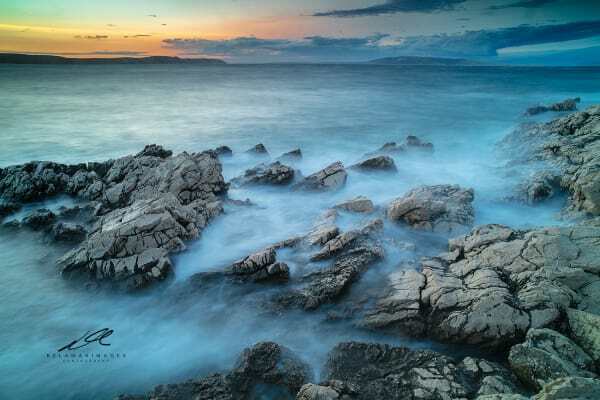 The inclusion of the foreground rocks give the perfect opportunity to use the Big Stopper, as well as adding interest and balance in the lower left corner. The calm waters allow the rocks and the grasses on the right to achieve prominence within the foreground, whilst the 117 second exposure has captured some lovely movement in those clouds. Paul Gallagher kindly made the selections this month. 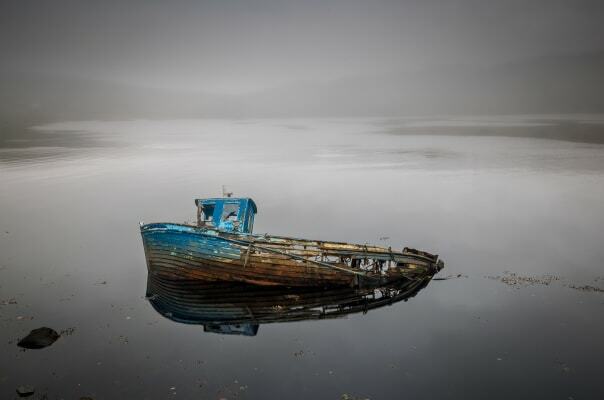 Paul has been a professional landscape photographer for over 30 years and is also regarded as a Master Printer dedicating his photography to Northern England, the Scottish Highlands and further afield around the world. Although Paul dedicated over 25 years to using large format cameras and wet dark room printing, he now mainly uses digital equipment for both capture and printing. He is a much sought after lecturer and has spoken in many countries as well as photographic societies throughout the UK. Paul runs landscape photography workshops in the UK and around the world for his company Aspect2i. He has received many commissions from organisations such as the Environment Agency and the BBC and his work has been used extensively by Epson, Ilford and Permajet to name a few. I love the diagonals in Mathew’s composition, which lead the eye into the far distance where the sun is setting. 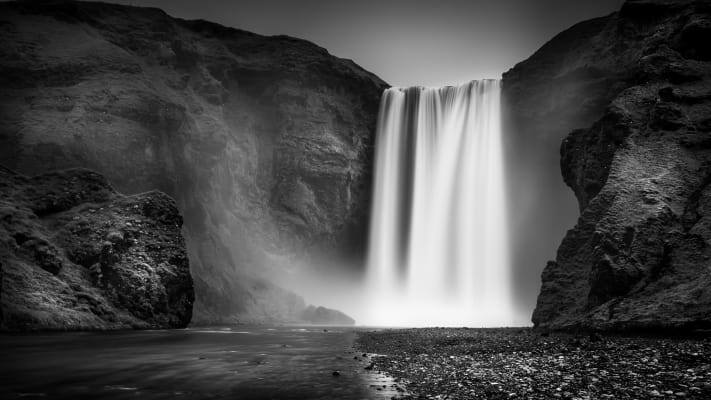 The Big Stopper has helped to simplify the photograph by calming the texture of the water. The warm colour tones in the photograph are also very special. Having been to this location many times I can see that Feliksas has made a wonderful photograph of the place and captured its grandeur and drama perfectly. 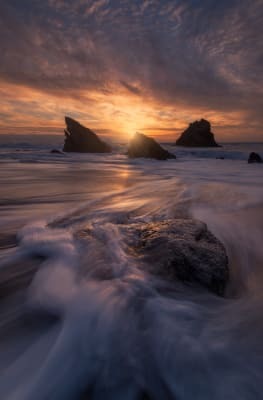 The use of the Super Stopper and 0.9ND Soft Grad are perfect, the foreground rocks are superbly contrasted with the body of silky water and the grad has achieved lovely transitions of tones in the sky. The moment I saw the low contrast and soft tones in this image I was drawn in and fascinated. The portrait format in Tevfik’s photograph is very important and works perfectly with the subject matter as the eye is guided along the rocky shoreline to the distant headland beyond. Having worked most of my professional career in black and white I was drawn to Brian’s beautifully simple coastal scene. I think the wooden posts are positioned superbly in the square frame and I love the subtle suggestion of something beneath the foreground water surface which can be seen which has been made possible by the use of the Big Stopper cutting out water textures. I think Iain’s photograph of Bamburgh Castle is staggering in every way! The combination of the Big Stopper to capture the subtle cloud reflections with the Polariser saturating the colours and allowing the viewer to see beneath the water surface is perfect. This photograph has everything from subtle calming colours to staggering detail throughout. The plateau of rock gently lit by the evening sun serves perfectly to guide the eye to the castle. Lizzie Shepherd kindly made the selections this month. 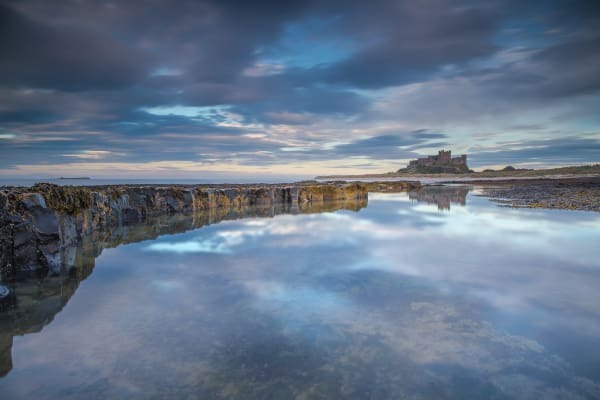 Lizzie is a professional landscape photographer, speaker, teacher and writer, based in North Yorkshire, specialising in landscape, nature and travel; she also does some commercial photography and commissions. 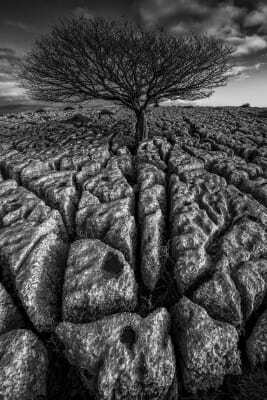 She exhibits her work on a regular basis and a selection of her prints are on permanent display at the Joe Cornish Gallery in Northallerton. She offers a number of small group workshops and 1-2-1 tuition in the UK and further afield. 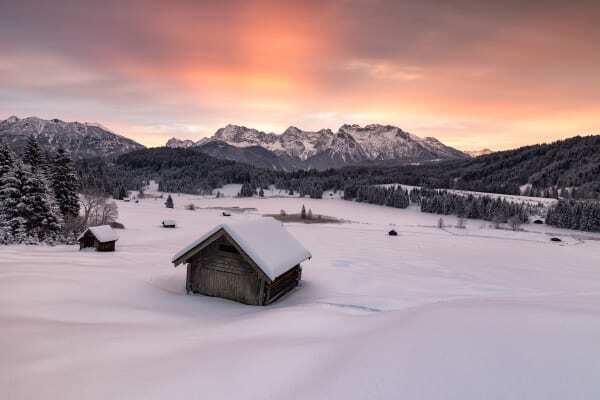 A beautifully crafted image – the composition is balanced, the edges are very well placed and it has a wonderfully inviting, warm glow about it – it really makes you want to be there. Use of a Big Stopper and polarising filter has allowed a long exposure of 60 seconds. Not so long as to lose all texture in the water, but enough to smooth out both sea and sky, so emphasising the gritty textures of the mountainous backdrop. The time of day is also well chosen, with warm light on both the wooden cabins and the ridges beyond, drawing you into the scene. A delightful and graphic image, minimalist in many respects but with a little twist. These are the kind of scenes for which the Super Stopper is made but the success of the end result depends upon a really good composition. This feels just right to me – the relative heights of horizon and top of the lighthouse sit very comfortably and the very long exposure of 244 seconds has produced the silky smooth tones that work so well here. I also feel a square crop was an excellent choice. Another well-framed image – the elements are well balanced and, overall, there’s a good flow to the composition. The light reflecting off the boulders is wonderful. The 13 second exposure, courtesy of a 2 stop ND filter, has retained the lovely texture in the sea, though possibly a few seconds less might have been even better. I’d have liked to see a bit more detail in the shadows of the distant cliffs and, likewise, I find the very dark boulder in the centre foreground a little dominant. The way in which we respond to a picture is a very personal thing but this immediately took me back to a visit to a shadow puppet play in Indonesia, many years ago. The hazy and pareidolic form of the clouds on the horizon is the key here – providing intrigue and a sense of mystery. They are perfectly positioned in relation to the rotunda on the pier and I also really like the use of negative space across the image. This is a very bold and complex composition and I enjoy it for that very reason. 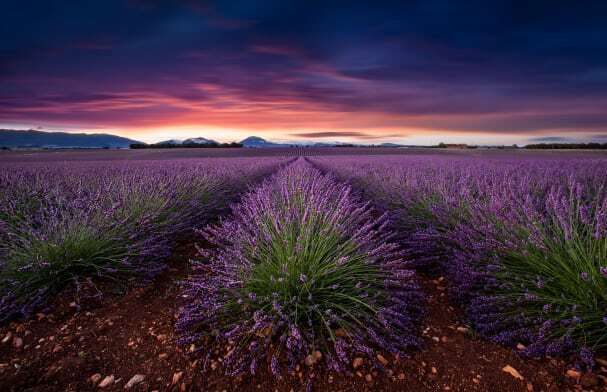 By using an ultra wide-angle lens and getting so close, the photographer has given great emphasis to the foreground plant. A polarising filter can really help enhance the colour of wet leaves, although I’d be inclined to try reducing the saturation of the greens here to make the leaves a little less dominant. The mirroring of the fallen branch below and above the waterfall is a really nice touch. John Miskelly kindly made the selections this month. 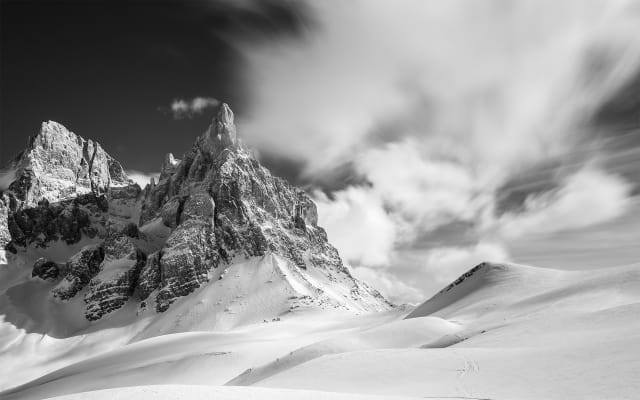 John is a Fellow of the British Institute of Professional Photography and is a multi-award-winning photographer, specialising in stunning fine art landscapes from around the world. He has a life-long passion for the wilderness and a keen eye for the many moods of nature. 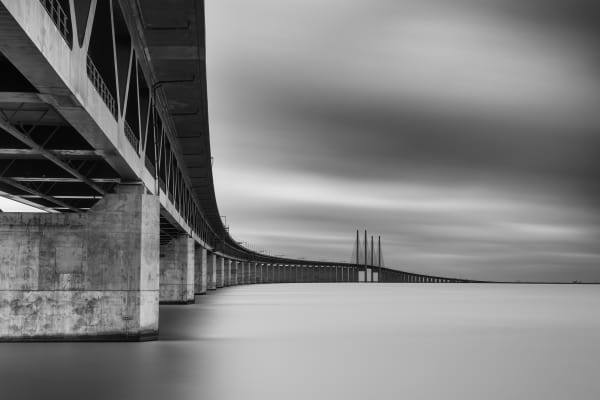 His landscape photography is an exploration of time, often using very long exposures to give a sense of time passing. The delicate tones in this image, along with a strong composition make it stand out. The fact that the ice covered wooden stumps lead the eye in to the old structure in the background, whilst retaining separation between the two elements is an excellent use of composition. I’m in two minds whether I like the sand at the bottom right hand corner of not. Normally I would prefer the simplicity of the image without the sand, but in this case, I think it may even add to the image. This image has a lovely quality of light, which gives a sense of atmosphere. The author has resisted the urge that many fall for, in that he hasn’t over processed the image. The use of the Big Stopper has given the sky a quality of tone and the radiating cloud effect balances the image nicely, particularly with the lighter part of the sky behind the mountain. The detail in the ice in the foreground contrasts with the majesty of the mountain in the background. An image from my own part of the world, so I know it well! I love the tones and textures in the image. 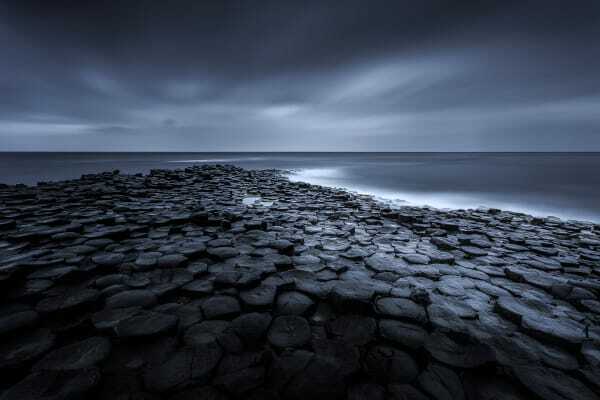 The fact that the image was taken with a foreboding sky means the tones are well matched between the sky and the dark rocks of the Giants Causeway. The long exposure gives the breaking waves the white line that separates the rocks from the sea. The curve of the rocks is compositionally strong and the image is what I would call, well balanced. This image just exudes mood and atmosphere. 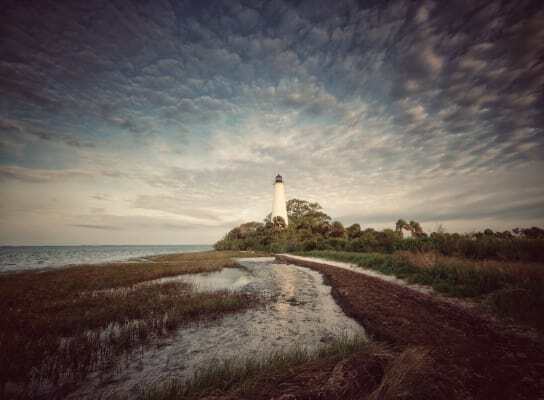 The author has used a polarizing filter, a Little Stopper and a Chocolate Hard Grad, a great example of how one can combine filters to create a super image. It’s the combination of light, composition and subject that come together to give any image ‘emotion’. 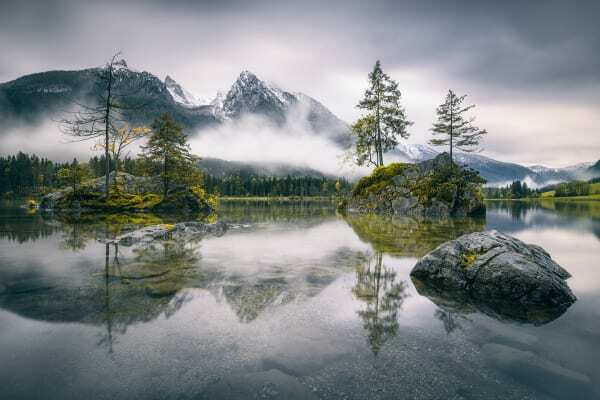 In this case, the foreground stones at the edge of the lake give enough interest to draw the viewer’s eye into the reflections in the lake and then up to the mountains and the sky. Another very strong composition and use of light. The wooden stumps starting from the bottom left hand side lead to the horizontal stumps further out from the shore. These stumps are well below the horizon, so don’t spoil the ‘balance’ of the image. 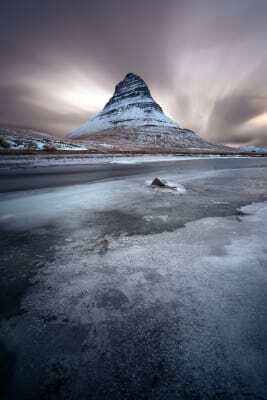 The use of a hard graduated filer was a perfect choice for this image along with the Big Stopper. The smoothing of the water and the sky means that there are no distractions and the stumps stand out much more than if the Stopper hadn’t been used. Sarah Hatton kindly made the selections this month. Sarah is a passionate, driven landscape adventure photographer based in Melbourne, Australia. Inspired by nature, and fuelled by the fires of creative endeavour, she is ever-searching for that next level in her photographic work. Her signature is stunning landscape & long exposure work, where she turns minutes into moments through her use of ISO100 to slow the passing of time. What an absolute ripper of a scene! This one really caught my eye for many reasons: beautifully balanced scene, perfect tones, crisp foreground and a little hint of milky way to top things off. This is a super clean image, simple and well balanced with a beautiful symmetrical composition. 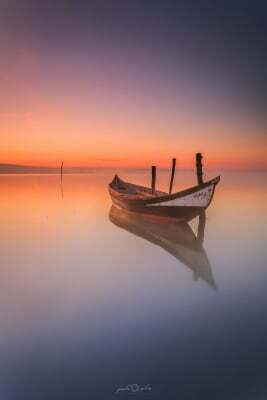 It really conveys a sense of peace and calm to me though its simplicity and pastel tones. Love the rocks in this shot. 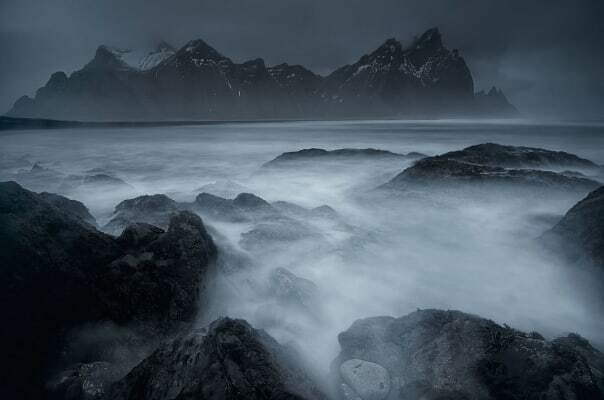 Excellent scene with such movement and power conveyed from the breaking waves and rocks. Absolutely love the dynamic foreground in this scene, the streaks in the sand create such drama. 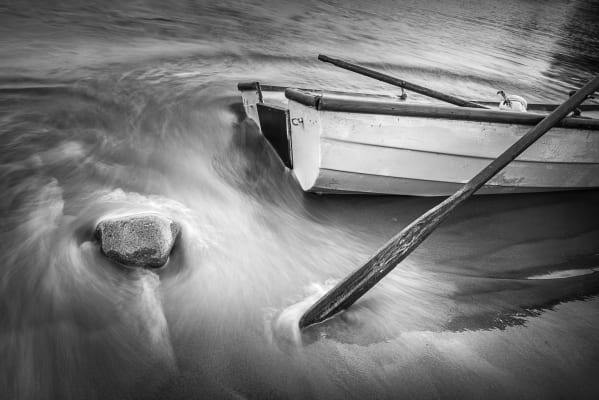 The mix of steely tones complimented by such interesting textures makes for a powerful image. 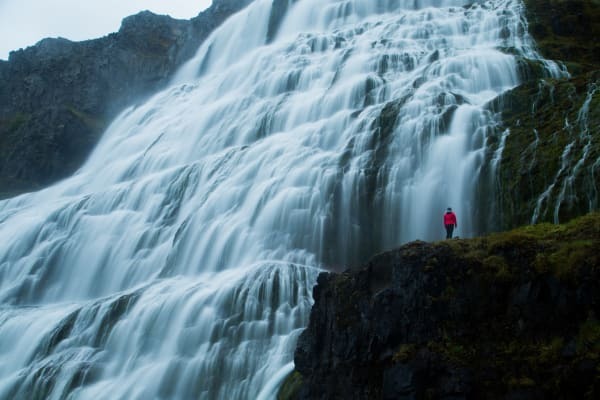 Waterfalls don’t get much more impressive than Skogafoss. Grandness of scale and a well-balanced scene… and showcased in black and white to add to the overall hard-hitting impact of such a scene. Antony Spencer kindly made the selections this month. 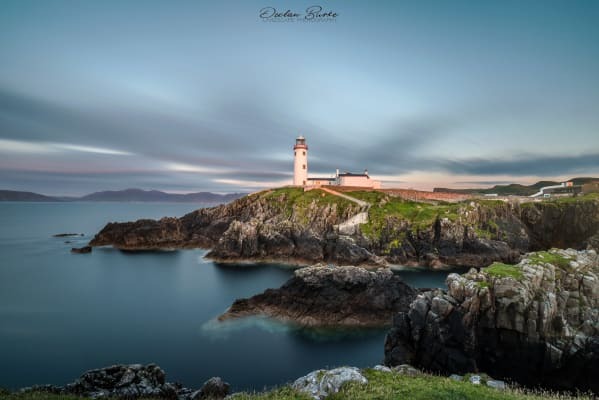 Antony has always had a keen interest in photography and started taking photography more seriously in 2007 with the purchase of his first digital SLR. 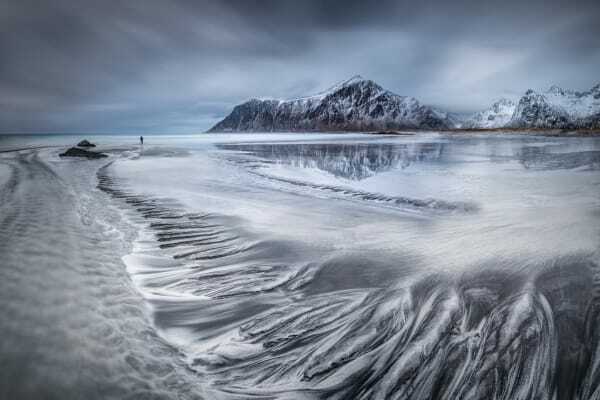 His short time with a digital camera makes his 2010 win of the coveted Landscape Photographer of the Year award all the more remarkable. The prize allowed him to leave his day job and concentrate full time on landscape photography. He is based in Dorset and has a passion for capturing the landscape in the best available light wherever and whenever possible. Having lived his whole life in the South West, he is very passionate about the varied landscape there. Antony also spends a great deal of time in the Arctic chasing Aurora Borealis and arctic winter landscapes. We see a great deal of long exposure photographs now and more often than not the photograph doesn't benefit from the use of dark ND filters. Here though, the dragging clouds enhance the depth and compliment the line of the meandering track through the foreground. The balance of light and tones between the sky and the foreground is very believable and the colours created by the low sun angle have been captured beautifully. This a view I know very well and what an amazing one it is too! This is a very challenging image to pull off, the light has to be balanced perfectly with the lights from the village and this has achieved that. 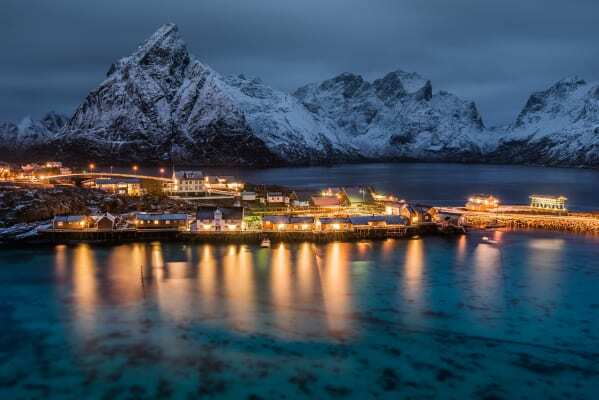 The snow-covered mountains coupled with the cold tones of blue and white make the warm street lighting and the warm coloured houses feel very safe and inviting. The emotions captured in this photograph are stunning. The drama of the light and passing storm is very subtle and very believable. I really like the processing and how this photographer has pulled out the details of the storm clouds without going too far. This is a lovely composition. The sense of depth created by the photographer here is perfect. I love how the composition makes my eye meander gently through the rocks, picking up the river or road in the distance and all the way through where I'm held in the sky with the gentle glow of the diffused sun. Wow! What a sky! I really enjoy the depth created by the converging lines into a central point towards the horizon. Those lines really pull the viewer into the distance of the image and that incredible thunderstorm which is of course, the star of show. Mark Bauer kindly made the selections this month. 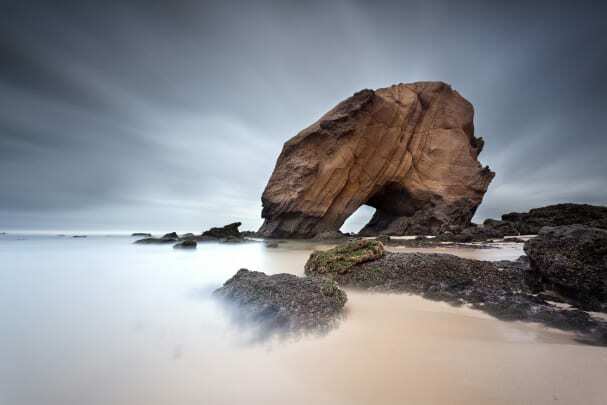 Mark's passion for photography began in the early 1990’s when he was living and working in Portugal and he has been a full-time professional landscape photographer since 2003. Having cut his teeth on medium-format transparency film, he switched to digital in 2006. Mark supplies three leading image libraries and his work has been published around the world in books, magazines and newspapers. 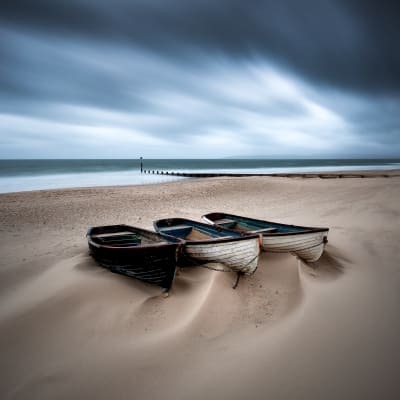 He is a regular contributor to the UK photographic press and the author of four books, including The Landscape Photography Workshop and his latest book, Photographing Dorset. This image caught my eye, because by coincidence, I lived in Aveiro (where it was shot) in the early 90s. It was here that I first became seriously interested in photography and used to shoot scenes like this. To be honest, Paulo has done a much better job than I did back then. 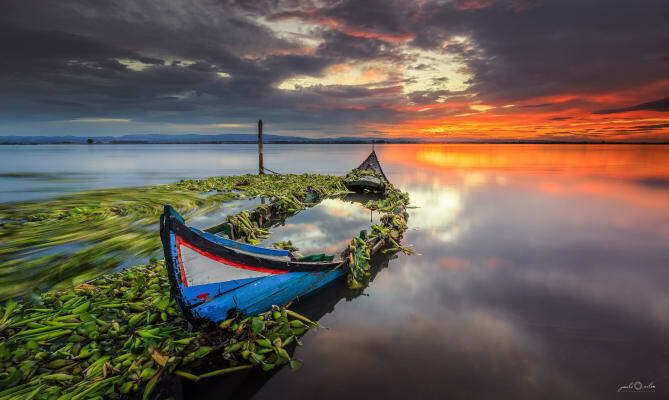 The composition is strong and the shot very striking, with the boat looking as if it’s being slowly reclaimed by nature - I love the reflections on the water inside the boat. Being picky, there are a couple of little niggles. First, I think the sky is slightly over-gradded - it is darker than the reflection - so I don’t think the 0.3ND Very Hard Grad was necessary. Secondly, I find the swirling reeds/weed to the left of the boat slightly distracting. A faster shutter speed could have frozen the movement. Losing the Polariser would help - it’s not necessary if you don’t want to remove the reflections - as would opening the aperture a bit. With careful focusing, it would still be possible to get enough depth of field. Finally, and this is easily addressed, I’d pull back on the saturation slightly. This is a very moody shot, which shows how important it is to shoot in light that suits your subject; imagine this same scene under a blue sky on a summer’s day. Results can be dramatic, but it’s not easy shooting into the sun. Exposure and flare can be a problem, so Dave has done a good job of getting the former right and avoiding the latter. For the most part, there’s good detail throughout the tonal range from shadows to highlights - using a 0.9ND Hard Grad has helped here. With the sun low on the horizon, a Hard Grad was probably the best option to control the bright tones there, but there is evidence of the filter’s transition line darkening the top of the barn. Some careful digital dodging might help. This isn’t a criticism, but an alternative - a smaller aperture might have resulted in a ‘sunstar’, which could provide a very distinctive background focal point - maybe Dave shot an alternative version like this? This is a really interesting shot and the contrast of warm tones in the sky and cool tones in the foreground works really well. The textural contrast between the soft, smooth textures in the foreground and the rugged, jagged peaks of the mountains complement this. Florian has filtered the scene well - the 0.9ND Soft Grad blends in with the mountain range and is completely unobtrusive - as graduated filters should be if used correctly. The image is nicely processed, too, with vibrant but believable colour. 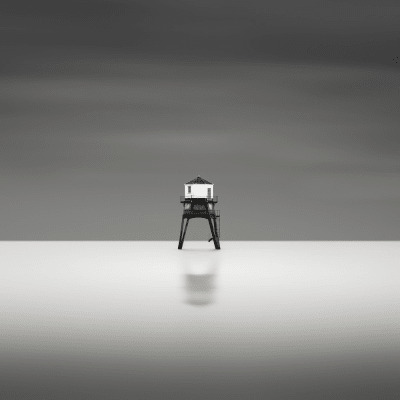 This is a lovely Big Stopper image, with a bold, minimalist composition. 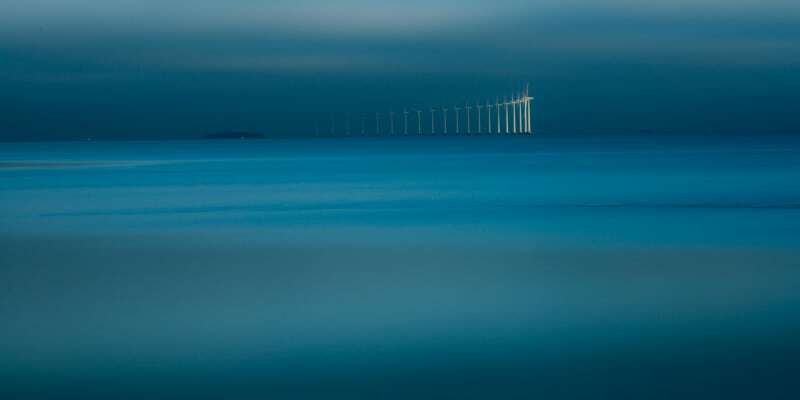 I love the smooth texture in the water and sky and the splash of light on the end of the row of wind turbines. 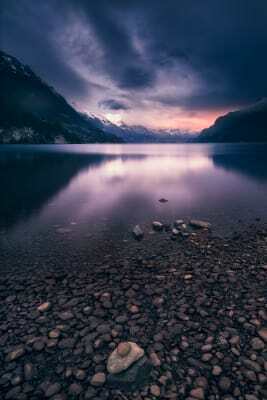 The image has the characteristic cool cast of the Big Stopper and I think this really adds to the atmosphere. Some people might feel that the sky is slightly over-gradded and that the use of the 3-stop grad was not necessary, but I like the stormy, moody effect it’s created. I like the negative space in the composition, but I wonder about the crop; for me, a squarer aspect ratio - 4:3 or even 1:1 might suit the image better, as the main subject doesn’t stretch far enough across the frame to make the panoramic crop work. I’d also have placed the turbines lower in the frame; it’s hard to rationalise, but I feel the overall balance would be better. These cropping options are very likely possible from the original frame. This is a nicely seen image and it caught my eye because it’s something I probably wouldn’t have spotted. With landscape, the usual approach is to try to show the whole vista, perhaps including the boat as foreground interest for the wider view. The tight crop might have been from necessity - perhaps the rest of the scene was cluttered or ugly - or it might have been simply that the photographer chose this crop for pictorial effect. Either way, it works really well. The elements are arranged really well in the frame. The rock is perfectly placed and I love the strong diagonal of the oar coming into the frame from the right; this contrasts really well with the horizontal lines of the boat. Colin Prior kindly made the selections this month. 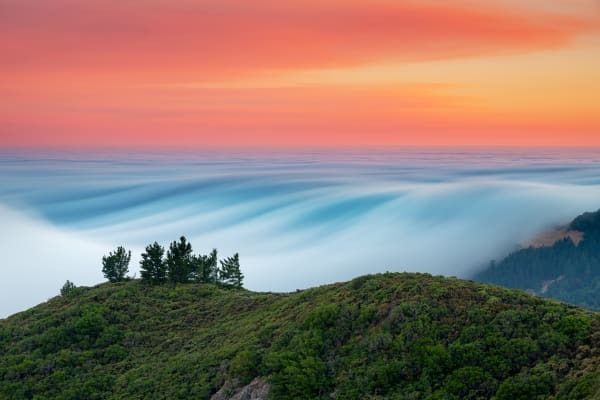 He is one of the world’s most respected landscape photographers. Born in Glasgow, his proximity to the Scottish Highlands shaped his passion for the outdoors and fostered his interest in photography. His photographs capture sublime moments of light and land, which are the result of meticulous planning and preparation and often take years to achieve. He is currently working on a four-year project in the Karakoram Mountains of Pakistan and nearer home on a new book entitled, Fragile. 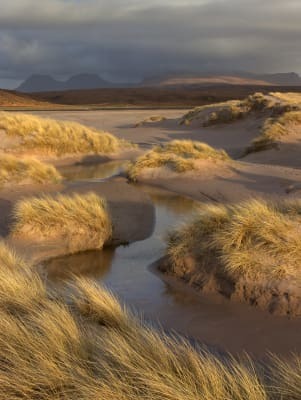 He is a Fellow of the Royal Photographic Society and President of the Association for the Protection of Rural Scotland. Strong compositional lines here hold the eye firmly in the turbulent amphitheatre and the photographer has been careful to lead the eye through the image from the bottom right hand corner of the frame. The strength of this image is in its simplicity and the fact that it juxtaposes the two colour opposites - magenta and green. Personally, I would have considered cropping this to 3:4 - I find the 2:3 format on the upright orientation too long and thin. 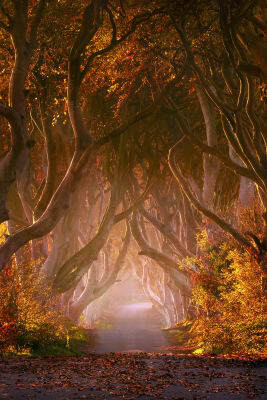 This haunting image looks to have come straight from one of the fantasy landscapes in the Chronicles of Narnia. Again, we have two colour opposites at work here - blue and yellow which have fused together harmoniously creating a feeling of peace and tranquillity. The warm backlighting picks up the icicles beautifully below the island, helping to create the ephemeral quality of the image. A strong composition in this image with the mountain peaks being framed by the two islands. A lovely airy and high key picture with a feeling of a pristine environment. Jeremy Walker kindly made the selections this month. 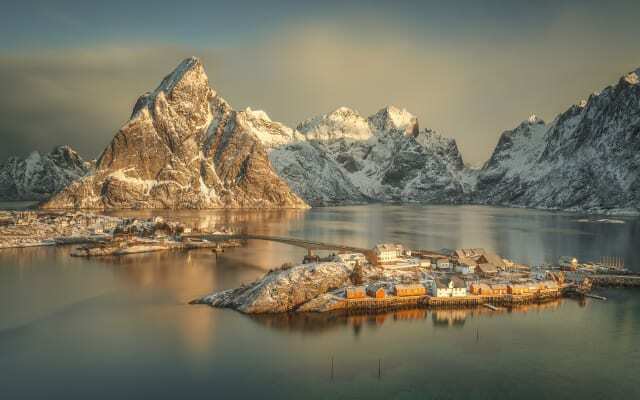 Brought up in the world of film, chemicals and darkrooms but now fully embracing digital photography, his awe inspiring panoramic images have earned him a reputation as one of Europe’s top landscape photographers. He shoots regularly for global ad agencies and corporate clients and represents Nikon as a UK ambassador. His easy going personality, inspirational photographs and love of the landscape make his workshops extremely popular for all levels of enthusiast. He is also a respected writer, guest speaker and lecturer. Chicago, IL. Before the Cubs won the World Series. An image with strong visual impact and it’s really refreshing to see a Big Stopper image that is not waves around a rock on a beach. A little thought has gone into the use of the Big Stopper and how it will impact on the final image and although some postproduction work has gone on it leaves the image with a unique look and feel. A great viewpoint, I love the low angle, quirky composition (the thin slither of ocean is just perfect) and the muted colour palette. 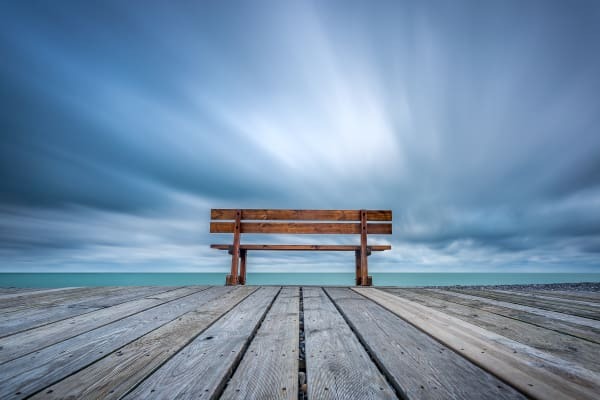 Some thought has gone into the use of the Big Stopper, the direction of the clouds and length of exposure playing a strong roll in the impact of the image by echoing the wooden boards in the foreground. A very strong, dark, brooding and moody landscape, that has plenty of depth and detail to it. Rocks, water and Big Stoppers do seem to go hand in hand and here the Big Stopper has created a ghostly fog of the water without it going too misty and milky. Retaining some detail and texture in the sea has helped the mood of the image, too much blur and motion and the strength of the image would be compromised. I would normally start to worry if someone was using four filters to achieve their results but I do like the mood and feel of this shot. Possibly the clouds are very slightly over graded for my taste with both a 0.6 Medium Grad and a 0.6 Hard Grad and I’m not too sure how much effect the Polariser is having on the scene. However, as an image all the ingredients are there and it does still work, there is plenty of mood and atmosphere and the image has impact, what more could you ask for? We select the right filter substrate for the right results. I wanted to blend the clouds into a soft smooth sky, without adding too much motion. I used the LEE Little Stopper to give a small amount of motion to the clouds, combined with a LEE 0.9ND Medium Grad across the sky to balance the exposure. The area of transition of a 100mm ND Grad will appear bigger, extending over more of the scene, on a crop sensor camera than on a full frame sensor. This effectively makes the grad "softer", preventing precise alignment and giving markedly different results when compared to its effect on a full frame camera. One solution is to select a harder grad, for instance instead of a 100mm ND Hard Grad select a Very Hard. ND Grads for the Seven5 system have tighter areas of transition than those for the 100mm or SW150 Systems. This results in a comparable effect between a 100mm Grad on a full frame camera and a Seven5 Grad on a mirrorless camera with a crop sensor. Note: Lens focal length can also affect results - with a longer lens making the grad appear softer. 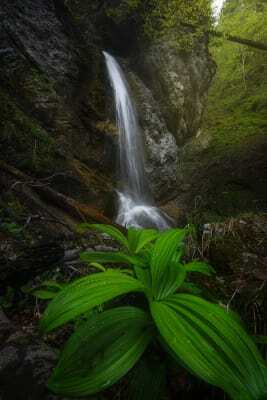 A great introduction to ND Grads from landscape photographer Joe Cornish. He explains why he uses them and demonstrates how they work in practice. In this video he focuses on just Soft and Hard ND Grads and explains how to select the right gradation and strength for the dynamic range in your scene. 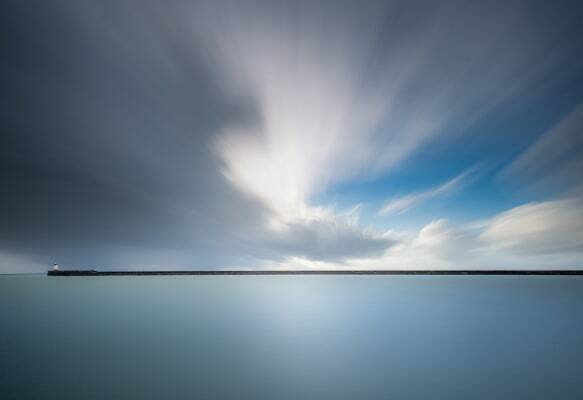 I wanted to create a smooth looking image, so I used a LEE Big Stopper to create the feeling of motion in the sky and to create a smooth silky look to the water. I also used a LEE 0.9ND Soft Grad to control the exposure of the sky. I used a Soft Grad as I didn't want to darken the large rock too much. For almost limitless options remember you can combine different ND Grads in the same holder. You might use them at different angles to create a staggered gradation effect or to subtly reduce contrast in different parts of the frame. ND Grads can also be combined with other filters for innovative creative effects. For instance they can bring subtle control when using a long exposure Stopper filter or simply combined with a Polariser or Warm-up filter. The possibilities are endless. James Pearson climbing 'Rhapsody' at Dumbarton Rock near Glasgow, one of the world's hardest climbs. The ND Grad is rotated vertically to balance the exposure between the rock face and the background. This can give very acceptable results with a high rate of success. Set camera to manual. Point lens at foreground and take average centre weighted meter reading through the lens. Note the exposure difference between ground and sky. The grad transition line should be visible through the viewfinder or on the LCD screen. Stopping the lens down and using the depth of field preview can make the grad transition line easier to see. Expose image using base exposure already established. A hand-held light meter gives more control and enables changing light to be monitored without repositioning the camera. The essence of this approach is: expose for the mid tones, allow for the shadows, filter the highlights. Lock camera in place on tripod. Take readings from scene mid-tones. For detail to be retained in shadows they should be within 2 stops of base exposure. If necessary increase base exposure slightly. Select the right ND grad to correct exposure difference to within 1.5 stops. Anything more than +2 stops will be burnt out in final image. The latest in our series presenting Master Photographers with three images that have special meaning for them. In this episode LEExposure Editor Ailsa McWhinnie meets respected landscape photographer Jeremy Walker. They discuss the story behind each image and Jeremy explains how the subdued palette he favours can help build a distinctive atmosphere. We have indexed over 500 lenses so you can quickly find the LEE System that's best for you. We regularly invite leading landscape photographers to share their inspiration, advice and technique in our press adverts. We've gathered together some of these for this online book — ViewPoint. Dave MacLeod climbing a new route 'Transition' at Beinn Udlaidh. Why use a ND Standard? Our ND Standards reduce the exposure equally across the frame. This increases shutter speeds and blurs movement. Our range extends from the 0.3 ND (1 stop) all the way to the new Super Stopper (15 stops). ND Filters can be stacked together, or used with other filters, so you can respond to almost any lighting situation. The ProGlass range (not pictured) sets a whole new standard in high quality glass neutral density filters. Sunset at Lonsfjordur - South Iceland. Our new app makes it easier than ever to calculate the correct exposure when using a Big, Little or Super Stopper. Reimagined for tablets these new eBooks take you through stunning landscape photos and the exact filters and techniques used.